Finding historic Route 66 in Albuquerque New Mexico is easy if you know where to look. Route 66 officially ran through Albuquerque from 1926 to 1985, and today Albuquerque is home to the longest urban stretch of Route 66 in the country at 18 miles. 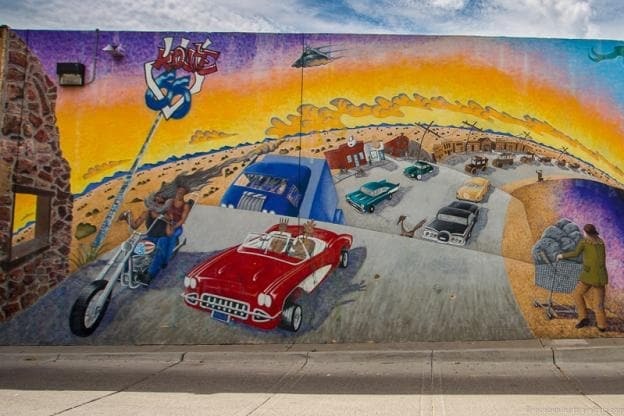 Route 66 played an integral role in Albuquerque’s growth and development in the early to mid 1900’s and today you can still find Route 66 era businesses, diners, motels, architecture, signs, and vibes in New Mexico’s largest city. You can still sleep in a classic Route 66 era motor court motel, eat a burger at a Route 66 era diner, and see some of the neon signs that have been burning bright on Central Avenue for decades. 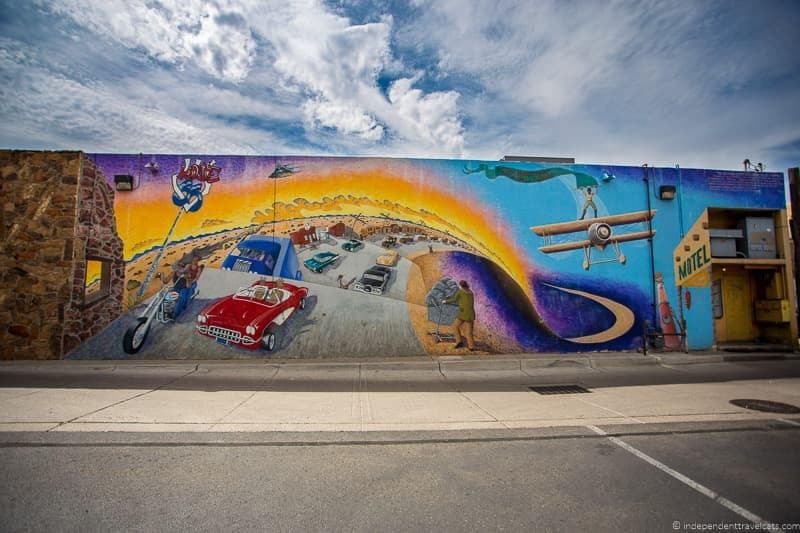 Albuquerque is a great place to “get your kicks” and we’ll provide a brief history of Route 66 in Albuquerque, share information on how to find and drive Route 66 in the city, point out all the Route 66 highlights in Albuquerque. We’ll share maps of all the best Route 66 attractions, help you find the best neon signs in the city, and give you tips on where to eat and sleep along the route. Albuquerque was founded as a Spanish colonial outpost in 1706; however, it really started to boom as a modern city in the early to mid 1900’s. This was due in a large part to Route 66. The city has long been multicultural, being strongly influenced by the Spanish, Mexicans, Native Americans, and other early European and American settlers. The route that is now Central Avenue has served as a trading route for Native Americans, a wagon trail for early settlers, and later the route for the city’s electric streetcar. The advent of the automobile and the establishment of Route 66 would bring a new mix of Americans to New Mexico from all over the country. The road would bring all kinds through Albuquerque, from migrants escaping the Dust Bowl and ravages of the Great Depression, military servicemen heading west during and after WWII, traveling movie stars, and families off to see the Grand Canyon and Disneyland. Route 66 always ran through Albuquerque. The first alignment of U.S. Route 66 through the city ran north to south along what is today 4th Street from 1926 to 1937. However, the later Route 66 alignment, ran through the city east-west from 1937 through 1985, and a number of tourist-focused business (e.g., eateries, hotels, gas stations) sprung up and thrived along what is today Central Avenue. Many Route 66 travelers decided to put roots in Albuquerque as they headed west looking for a better life, and it was the first major city westbound travelers would have seen in 100 miles after leaving Santa Rosa, NM. In fact, my friend Ethan’s grandmother’s family came here from Kentucky and decided to stay in Albuquerque seeing it as an oasis after passing through the dusty plains of Oklahoma and Texas during the Dust Bowl era. However, as shown in Disney Pixar Cars film, the heyday of Route 66 didn’t last for very long. Just as the automobile and highways like Route 66 reduced train travel and lead to the death of railway hotels, the coming of the interstate system would reduce the traffic along the older and slower highways like Route 66. Many interstates were simply run on top of sections of Route 66, but Albuquerque’s Central Avenue was spared due to local opposition. The I-40 runs parallel to the post-1937 Route 66 and I -25 runs parallel to the pre-1937 route. 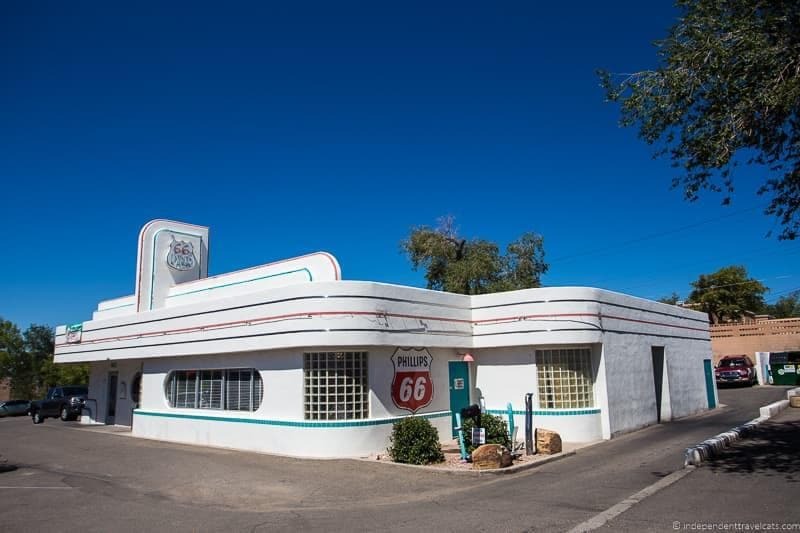 By the 1960’s, many of the businesses surrounding Route 66 were not doing well and it would not be until the 1980’s that economic conditions began to improve and interest rose in protecting and revitalizing old Route 66 era businesses and buildings. Today, some of those Route 66 era businesses survive and you can still eat, drink, and sleep in several of the same spots as American travelers in the 1950’s. 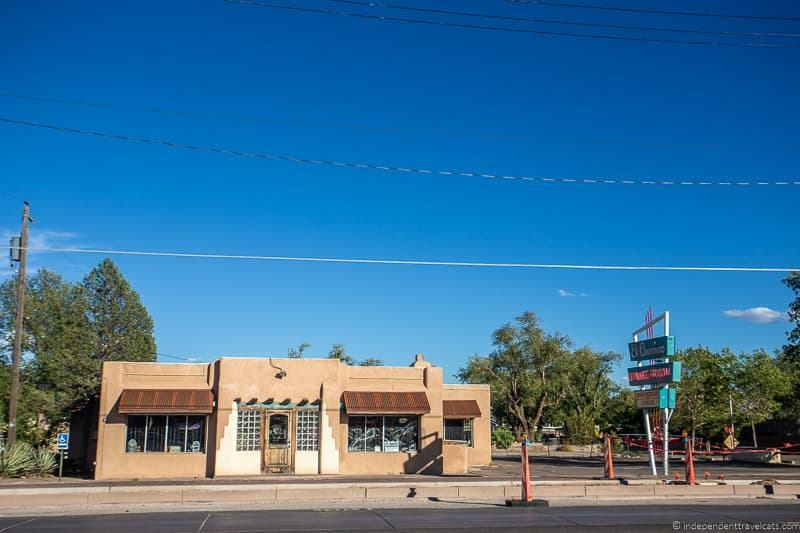 Many businesses have since closed, but you can still see a lot of surviving architecture and signs from the Route 66 era along Central Avenue and 4th Street, some are now abandoned while many others are now inhabited by thriving new businesses. If you have driven historic Route 66, you’ll know that the businesses along Route 66 come and go, and that many post-Route 66 era businesses that promote the historic route have become Route 66 fan favorites alongside the classic historic ones. We’ll share both in this post although we’ve tried to clearly distinguish between the classic Route 66 era businesses and the more modern Route 66 favorites. Albuquerque is an easy place to drive Route 66 as most people simply drive from one end of Central Avenue to the other. However, if you start researching information on finding Route 66 in Albuquerque or looking for maps about historic Route 66 in New Mexico, you may be a bit confused that the information don’t always line up. This is because there were two official routes in New Mexico, and both included Albuquerque. The pre-1937 Route 66 route (often called the Santa Fe Loop, which was the official route from 1926 to 1937) ran from Santa Rosa and then northwest to Santa Fe via Romeroville, Pecos, and Glorieta, and then southwest to Albuquerque and Los Lunas. However, politics would end up changing this route. It is said that 1920’s New Mexico’s governor, Arthur Hannett, punished the Santa Fe Ring for ruining his reelection plans by championing a new alignment of Route 66 that would entirely bypass Santa Fe. After 1937, the new Route 66 route bypassed Santa Fe, providing a straight drive from Santa Rosa to Albuquerque and saving drivers a lot of time and mileage. The two old routes cross at Central Avenue and 4th Street, and the two alignments reconnect in the town of Correo, NM. The original Route 66 runs south from Santa Fe through Bernalillo via HWY 313 and then onto Bridge Boulevard which crosses the Rio Grande into Los Ranchos and Albuquerque’s North Valley area. Here the route follows 4th Street for the majority of its time within Albuquerque. The area of main interest is probably the Barelas-South Fourth Street Historic District which has several former Route 66 era buildings and signs. If you are planning to follow Route 66 beyond Albuquerque, I would highly recommend getting a copy of the latest edition of Jerry McClanahan’s EZ66 Guide for Travelers. We used it every day of our 2 week Route 66 road trip as well as this Route 66 map set. This is the most popular of the two route for Route 66 travelers as there is more to see and it runs through many of Albuquerque’s neighborhoods. Central Avenue runs east to west through the city and it is easy to follow from east to west or west to east. 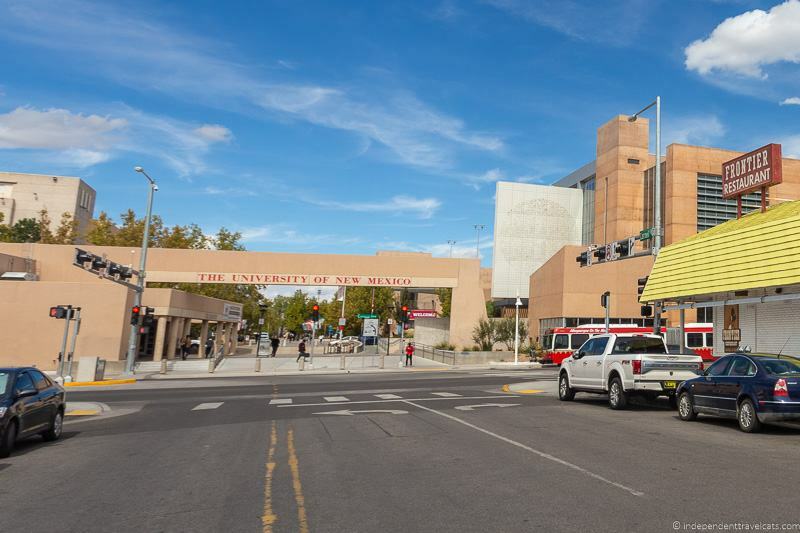 It intersects with I-40 on both ends and runs for about 18 miles right through central Albuquerque, including the areas of Nob Hill, Downtown, Old Town, and past the University of New Mexico and city fairgrounds. Central Avenue is the route that most Route 66 fans drive, but if you have the time I’d also recommend taking time to explore 4th Street. 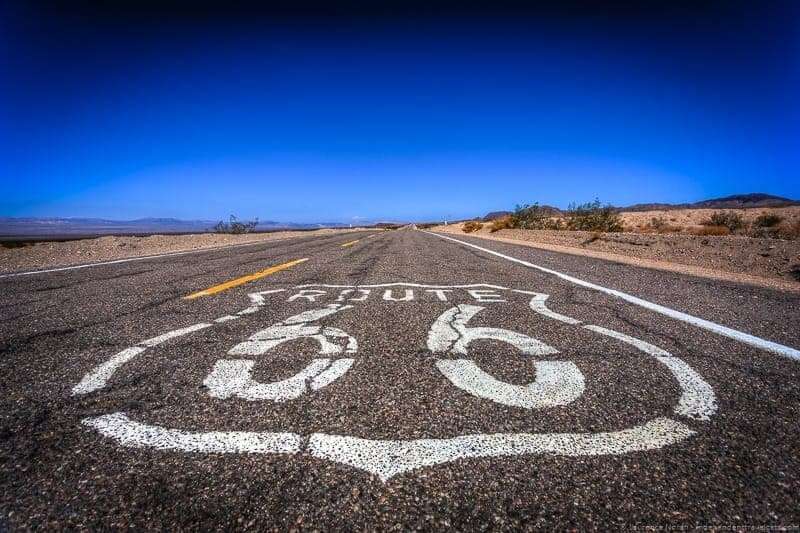 So Route 66 is all about the automobile (or motorcycle) and driving along the open highway; however, maybe you are visiting without a car or prefer to explore the city using a more environmentally friendly transit option. Or maybe you are looking for options to not get caught in the current construction delays along Central Avenue. Luckily, most of Route 66 can also be easily explored by bus or foot. A mile or so stretch of the road is also open to bikers. Park & Ride options are also available in a number of places in the city so car drivers can easily park their cars to take the bus. Currently there are three main buses operating along Central Avenue (66, 766, and 777) and buses 766 and 777 are part of the new electric Rapid Transit System. The other bus is the aptly named 66 Central Avenue bus that traverses. You can use these buses to travel from the intersection of Central Avenue and Unser Blvd to the intersection of Central Avenue and Tramway Blvd and vice versa. The buses are a great (and inexpensive) way to see Route 66 without a car and even if you have a car, you can use Park & Ride at either end of this bus route. If you want to explore 4th Street (pre-1937 Route 66) it is a bit trickier and there is no single bus, but you can get to any location using the buses. Bus 10 heads north of Central Avenue along 4th Street to Alameda and buses 54 and 53 do sections of 4th Street south of Central Avenue. You can check out all the ABQ bus schedules online and track them in real time. The full route from one end of I-40 to the other following Central Avenue is about 18 miles. This is a long way for most people to walk, but it is easy to choose a 1 or 2 mile stretch to explore in the downtown area. 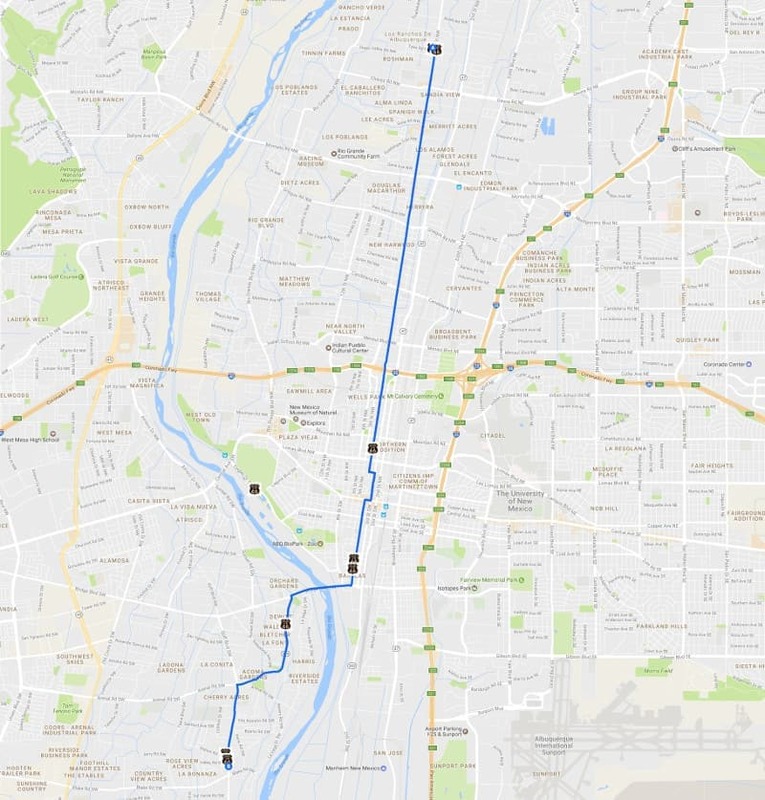 If you really love walking and want to do the full stretch along Central Avenue, you could plan a 2 day trip to walk along the stretch and stay at a motel or two along the way. For those who want to see more of Route 66, taking some time to walk, especially in the Downtown area is a great way to see more of the historical buildings, signs, and murals. There are way too many Route 66 associated places to include in any single guide and so many of the buildings along this stretch date back to the Route 66 era. It is also a great way to explore some of the local hangouts and have a chance to chat with some of the residents. Albuquerque has been becoming more and more bike friendly since the days when I used to live there. There are currently over 400 miles of bikes lanes and paths in the city. Unfortunately Central Avenue is still not the best place to bike in Albuquerque as most of the road does not have any designated bike lanes. However, there is a stretch or two of Central Avenue that does have a designated bike lane if you are interested in biking a section of old Route 66. Check the latest info on bike lanes using the Albuquerque bike routes maps online as well as biking tips for Albuquerque. Perhaps in time more of Route 66 route will be bikeable but if you are interested in biking elsewhere in the city, there are a lot of other areas open to both street biking and mountain biking. You can rent bikes at a number of locations in the city including Routes and The Bike Smith, and Albuquerque also has a bike sharing program. In general, all you need is a way to get around and some information so you know how to find and what to see on Route 66 (like this post!). If you want to stay in one of the motels or hotels along the route (see our recommendations at the end of the post), I would recommend booking that in advance. If you are coming for the Albuquerque International Balloon Fiesta or just happen to be in the city around that time, book everything (e.g., hotels, rental cars, shuttles) as far in advance as possible and just note that prices will be higher and places more crowded than usual. If you are driving in Albuquerque, be sure to always lock your vehicle and avoid parking in alleys or isolated parking lots, particularly in the evenings. Car thefts and break-ins are not uncommon (I know from personal experience). I love Albuquerque but it has a big auto crime problem. For further general Albuquerque planning advice, you can find lots of info on the Visit Albuquerque website and our articles on recommended things to do in Albuquerque and where to eat in Albuquerque. If your trip is taking your further along Route 66, I recommend reading our planning guide to Route 66 which covers all the basics and has a large list of resources. Then for itineraries, we recommend our suggested 2 week Route 66 road trip itinerary. If you are short on time you can see our shorter 1 week Route 66 itinerary. 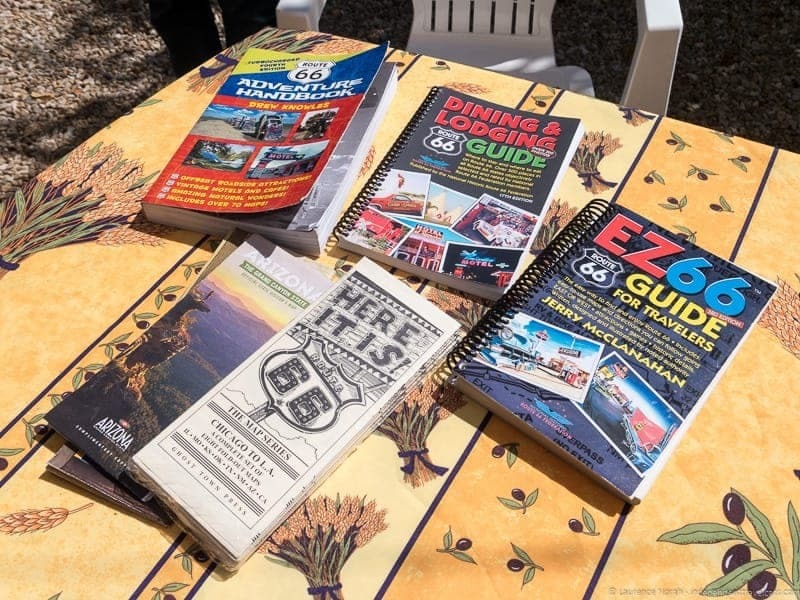 For a Route 66 trip, I also would advise buying a copy of the EZ66 Guide (make sure you buy the latest edition) which was an invaluable guide to helping us stay on the route during our 2-week Route 66 road trip. Other things we’d recommend considering would be the the Route 66 Adventure Handbook, Here It Is! Map Series (I would use these to use in combination with the EZ66 Guide rather than as standalone maps – they also make nice souvenirs), and a good recent USA road atlas (Rand McNally & AAA generally produce good quality ones). There are a range of places tied to Route 66 in Albuquerque including Route 66 era motels, former gas stations, neon signs, theaters, bridges, and diners. 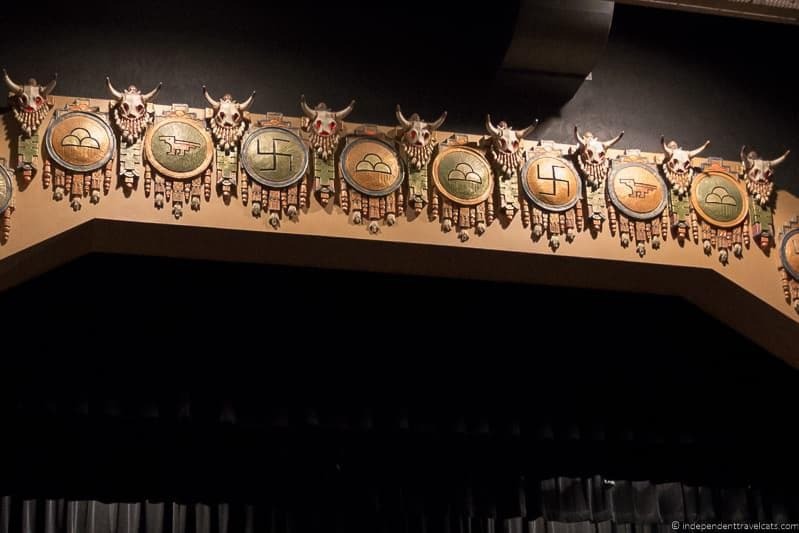 There are also more recent Route 66 tributes to be found in Route 66 themed diners, murals, museum exhibits, signs, and even a giant Route 66 themed casino. This is a long urban stretch of historic Route 66 (the longest actually!) and there are probably hundreds of Route 66 connections that could be made in Albuquerque. However, I have tried to strike a middle ground for those who want to simple drive along Central Avenue and see a few highlights from their car windows and those who have a more serious interest in the history of Route 66 in Albuquerque. I realize that many visitors are not interested in every old motel or diner whereas others love that sort of thing! So feel free to reach out if you have questions, and I am happy to try to answer them. I’ll start the Pre-1937 highlights (along 4th Street) for those wanting to drive the older route, and then do a separate list for those driving the more popular Post-1937 route (along Central Avenue). These are listed from north to south, if you are coming from the south, just reverse the list. I don’t know this area as well as Central so go slow and you may find some other gems as well. Part of this area makes up the Barelas-South Fourth Street Historic District which runs from about Stover Avenue to Bridge Street south of town along Fourth. This district contains a number of Route 66 era buildings list on the National Register of Historic Places; however, many are no longer open for business. We drove this stretch in the evening so sadly I don’t have many good photos from this route. The El Camino Motel is a Pueblo Revival motor court motel is the sole survivor of the many motels that once lined this pre-1937 stretch of Route 66 in Albuquerque. Vintage neon sign our front although it was not lit when we last drove by. The El Camino Dining Room is a casual locally-run restaurant built by Clyde H. Tyler in 1950. It a popular local place with 1950’s decor and serves a variety of New Mexican and American classic dishes. The neon sign says they serve only breakfast and lunch (when we passed in October 2018). It is located just across the street from the El Camino Motel although the two businesses have separate owners. 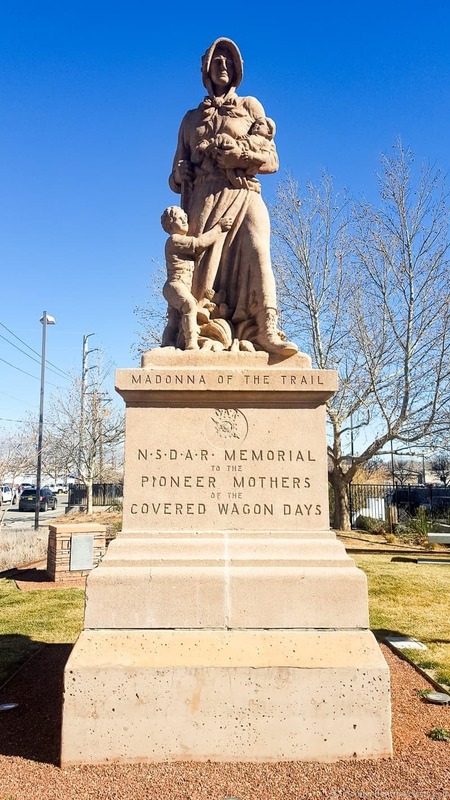 The Madonna of the Trail monument was first placed in Albuquerque in 1928 by The National Society of Daughters of the American Revolution to honor the strength and spirit of the pioneer women who traveled the National Old Trails Road (sections of which became Route 66). The statue shows a stern-faced pioneer woman holding a baby in one arm and a rifle in the other. A young boy clings to her skirt. It is one of 12 such 18-foot stone statues with one located in each of the 12 states that the National Old Trails Road passed through. We saw a few of the Madonna of the Trail monuments on our Route 66 travels. 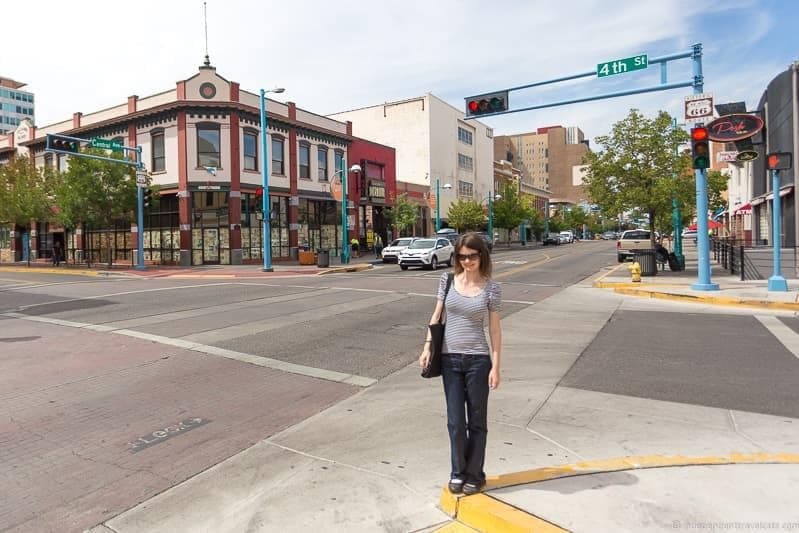 You can find it located at Fourth Street and Marble Street in Albuquerque, which used to face Route 66 travelers until the alignment changed to Central Avenue in 1937. Located a few blocks off the pre-1937 Route 66, Tingley Beach was once a neighborhood bathing pool and beach, known as Conservancy Beach and later called Tingley Beach in honor of Clyde Tingley, a state governor. In the 1950’s the beach was closed to swimming and became used primarily as a fishing spot. Today the facility offers fishing ponds, paddle boats, nature trails, a gift shop, restaurant, and a narrow-guage train ride. The train connects Tingley beach with the nearby Rio Grande Botanic Garden, Albuquerque Aquarium, and Rio Grande Zoo (all four of which are part of the larger ABQ BioPark). It is free to visit and we primarily came to see the ducks and walk around on sunny days. It is also a convenient place to stop if you are planning to also visit the zoo or aquarium. Arrow Super Market was one of the oldest surviving and still operating markets along Route 66 in Albuquerque. It has a great arrow sign outside and the whole supermarket has a vintage look. Unfortunately the Arrow Super Market has recently closed. It has since been sold to a couple who plan to fix it up and open it as an antique and vintage store called Box Road. 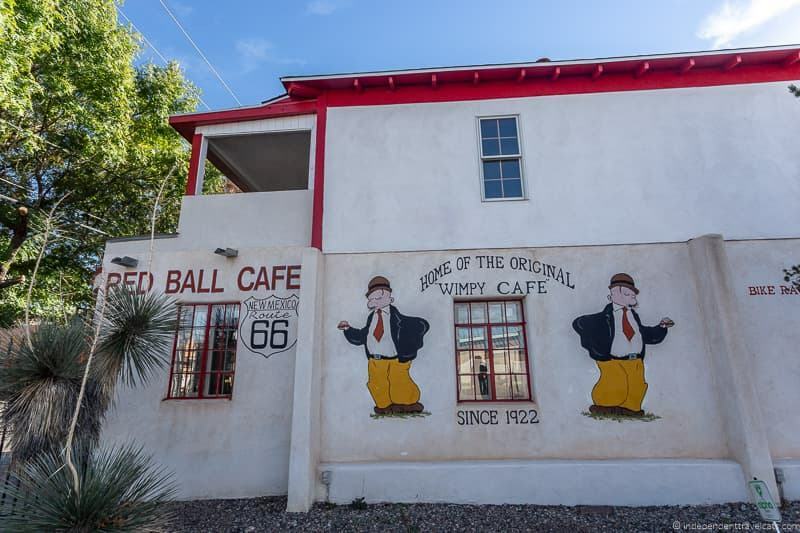 The Red Ball Café was long-time local burger joint and has been “home of the original Wimpy burger since 1922”. Well known for its tasty burgers, this place was closed for several years but reopened in September 2018! We were excited to see that it has been repainted and renovated but still retains its original architecture and ambience. Stop by for a Wimpy burger and their red chili and support this classic but new business! This Dairy Queen is a classic 1950’s store that offers all the usual American classic road foods as well as lots of ice cream delights. A great place for a quick meal or ice cream cone. Along Isleta Boulevard, between Patton and Ferris Streets, you can get a look at a large spray foam roadrunner. It is modeled after the cartoon version not the real-life ones. The greater roadrunner is New Mexico’s state bird. If you are spending time in the westside of Albuquerque, keep a look out (particularly in the mornings and evenings) for the real little brown birds. We often see them in parking lots and in the protected areas like Petroglyph National Monument. 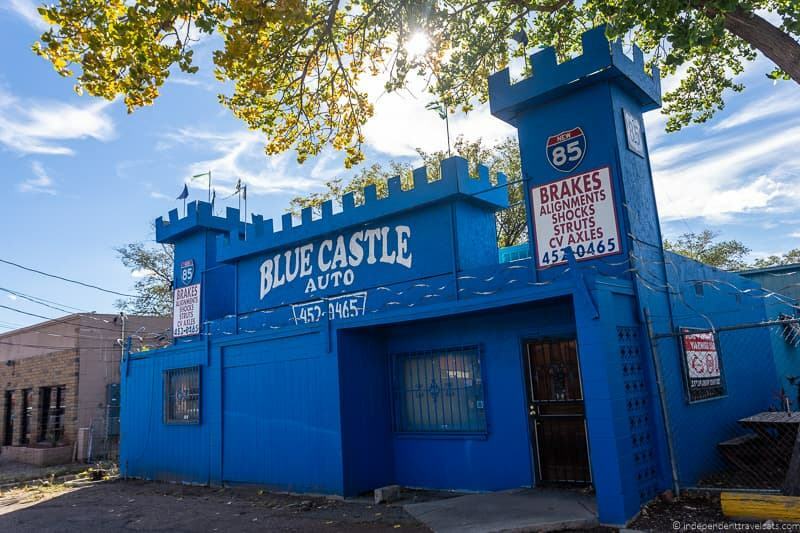 Blue Castle Automotive has only been in business since 1999, but this is the type of business that was always typical along this route. It is also notable because of the blue castle shaped shop! Good reviews so perhaps a place to stop if you need a tune-up or oil change while in the city. These are the highlights for those driving the post-1937 route along Central Avenue. In traditional Route 66 fashion, these are listed from East to West. If you are heading east, just reverse this list. The Tewa Motor Lodge was one of many motels that would appear along Route 66 in the 1940s and 1950s to cater to the unprecedented number of tourists who were driving through Albuquerque. Opened in 1946 following WWII, the Pueblo Revival style motor court became a popular spot to stay along the Mother Road and the property has since been listed on the National Register of Historical Places. Like many of the Route 66 era motels that used a name to evoke the Wild West or regional Native American tribes, Tewa refers to the name of a regional Pueblo language and the people who speak it. The motels neon arrow sign has been one of the most popular along Albuquerque’s stretch of Route 66. The Tewa Lodge was still operating when we last checked (phone: 505-255-1632); however, recent reviews have not been fantastic with guests noting that it has not been maintained well over the past several years. We’re hoping it stays open and gets remodeled soon! 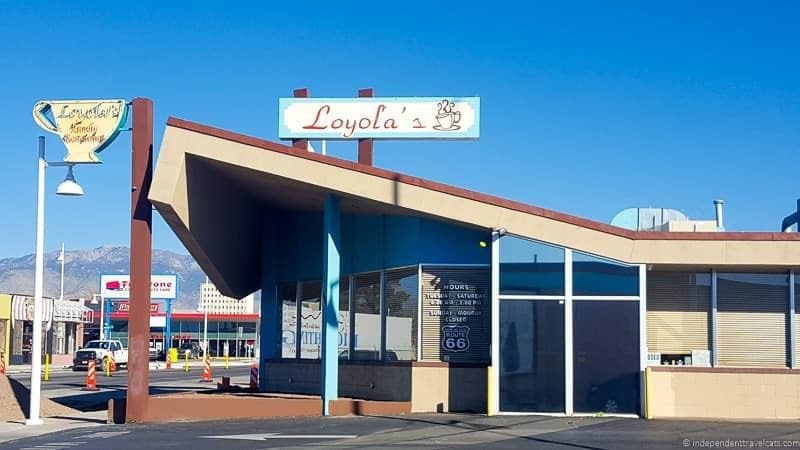 Loyola’s Family Restaurant is a busy well-loved local restaurant that has been serving Albuquerque since the 1950’s. Loyola’s serves both American diner favorites and New Mexican staples like breakfast burritos. It is open for both breakfast and lunch. The De Anza Motor Lodge was opened in 1939 by Charles Garrett Wallace who was making his living through trade with the Zuni people. 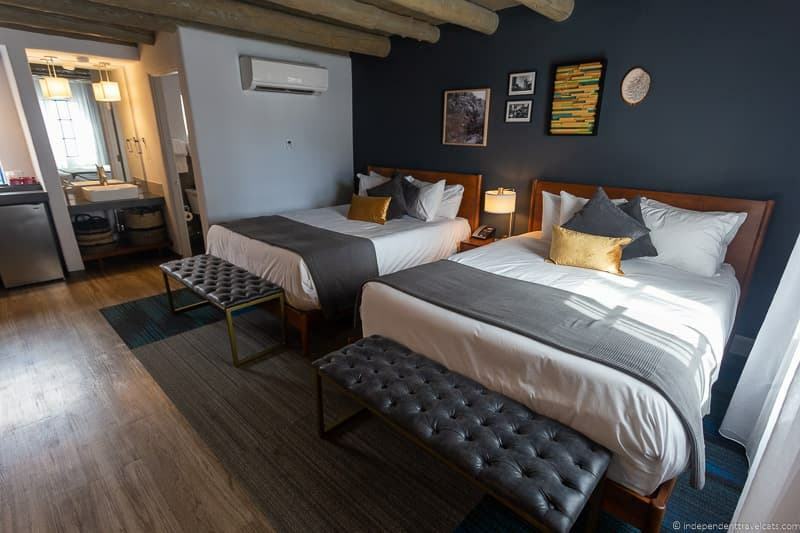 He opened the motel after seeing the number of new tourists arriving via Route 66 and the hotel design and decor was strongly influenced by the Zuni. 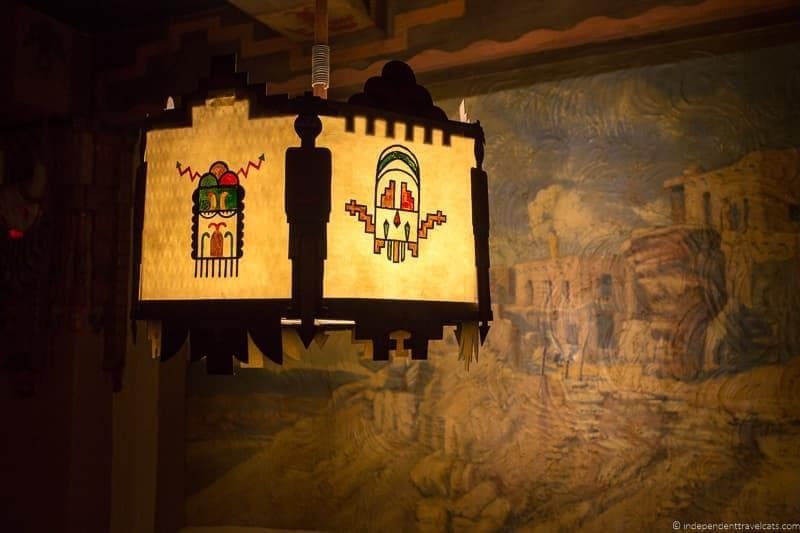 For instance one room featured a floor inlaid with turquoise and silver pieces, and two large murals in the motel were painted by respected Zuni artist Tony Eddakie. The gift shop sold Zuni crafts and jewelry. The motel ceased operations in 1993 although the buildings still remain and the parking lot was used as a filming location for hit TV series Breaking Bad. The city purchased the building back in 2003 but so far a number of development plans fell through. However, there has been construction happening here since late 2017, the sign has been removed, and the entire property is fenced off. We’re still hopeful it will be turned into either a motel and/or housing in the near future. 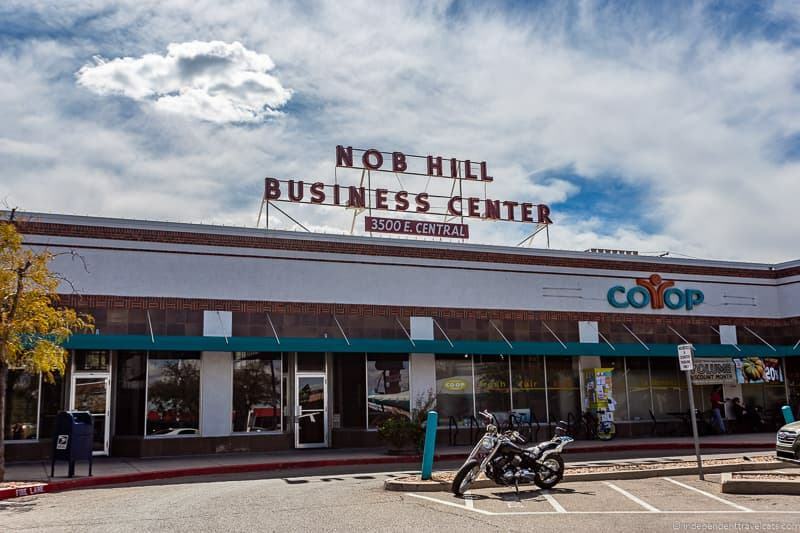 The Nob Hill Business Center, also known as the Nob Hill Shopping Center, was first built in 1947. It was the first modern auto-oriented shopping center in New Mexico, catering to the new auto-focused shopper and visitor. Many Route 66 travelers would stop here. At that time, there were few businesses in this area as it was considered too far from the center of the city; however, it was successful and is still in business today. It is Modern style U-shaped building with two pairs of decorative towers and stucco walls; another place listed on the National Register of Historic Places. Today it houses over a dozen businesses, most of them locally focused boutiques and shops as well as the popular Northern Italian restaurant Scalo. There is also a brewery, wine bar, and grocery store. Free 2-hour parking is available to patrons of the shopping center. A great place to support some of Albuquerque’s small businesses and find unique souvenirs. 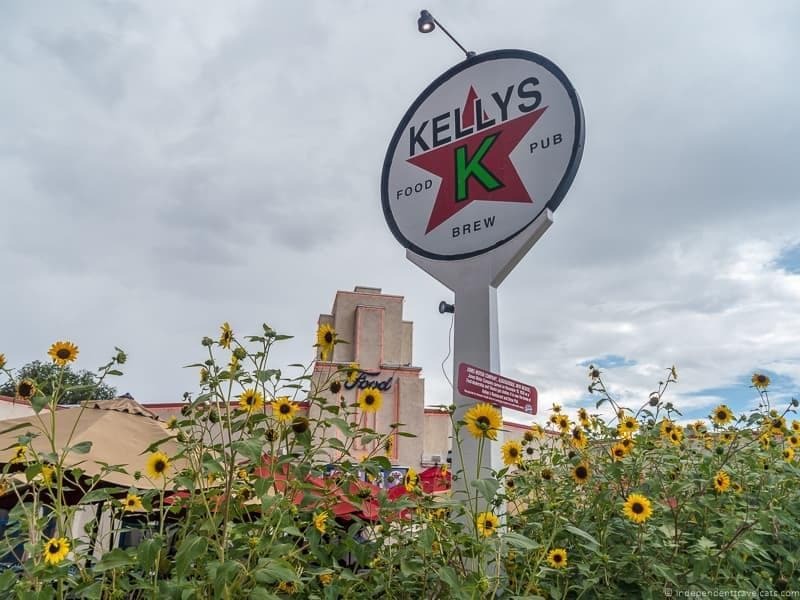 Kelly’s Brew Pub is a popular place to eat in Albuquerque within the Nob Hill area, and in fact was one of the first places I was taken to eat when I first moved to Albuquerque. However, the restaurant itself only opened in 1993, but the building it occupies is a 1939 Jones Motor Company Art Modern streamline building. 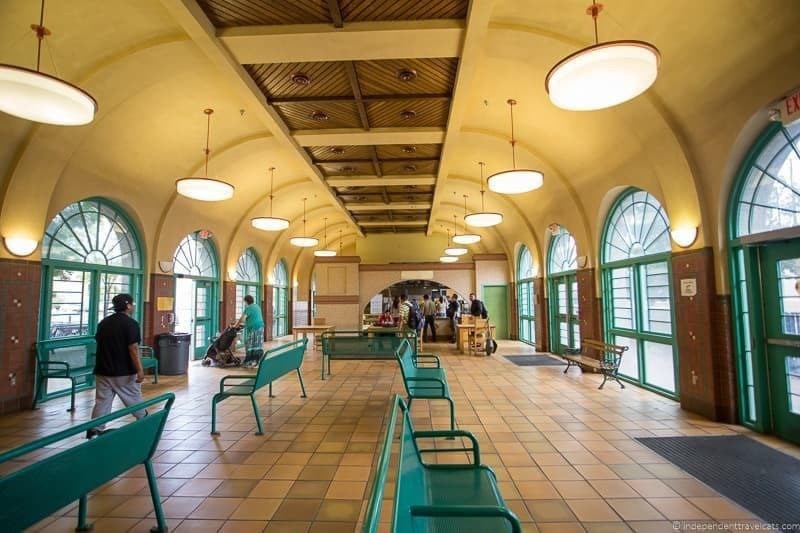 Designed by Ralph Jones, it originally was a gas station and Ford car dealership, and was one of the most modern stations in the West in its time. Although a number of changes have taken place with the many owners since it was a gas stations, many of the original elements remain here and it is listed on the National Register of Historic Places. The restaurant displays some of the old photos and newspaper clippings on the walls, has an old gas pump out front, and the original restrooms are still there. Route 66 is one good reason to come here, but the green chicken chile stew is an even tastier reason. I’ve eaten a lot of versions of this stew, but find this one of the best as its creamy, rich, and a little spicy and is served with a side of warm tortilla. Also a great place to come on a sunny day for a beer and lunch as there is outdoor seating available. You probably didn’t think you’d find a police station on the list?! 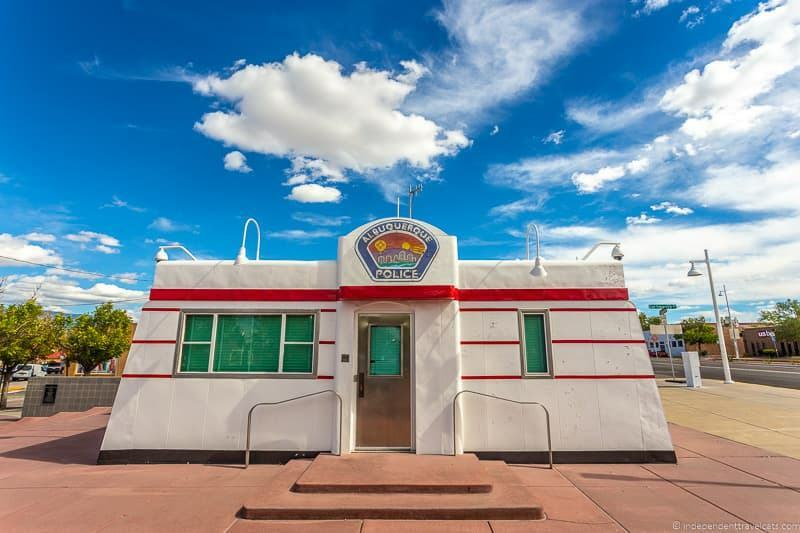 The Albuquerque Police Department’s Triangle Park Police Substation is located in a refurbished and renovated 1940’s Valentine Diner! 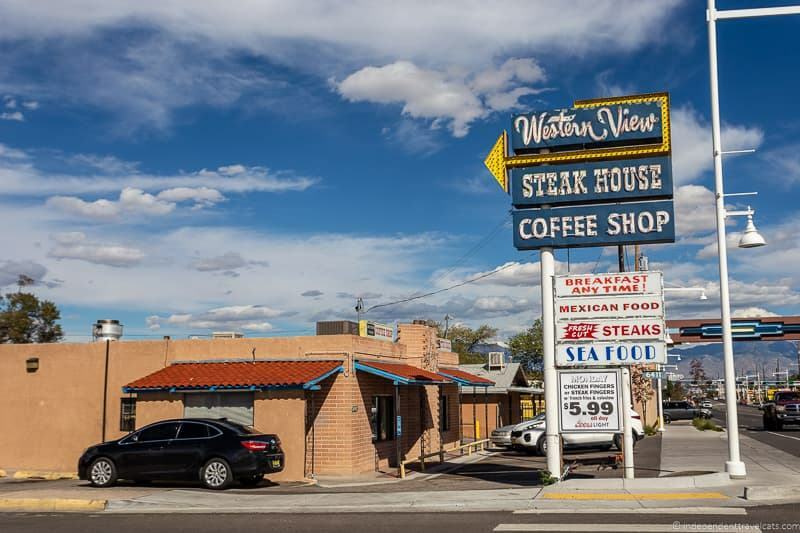 It was formerly known as the Little House Diner and was a 8-stool diner that original stood on the corner of 8th Street and Central Avenue in Albuquerque. The Valentine Manufacturing Company based in Kansas built a large number of these prefabricated small diners. They were built like a train car so they could be easily transported by the road or railway, and were delivered as ready-to-use mobile diners with stools, tables and counters, and a kitchen. These prefabricated diners were common in the U.S. from the late 1920’s to 1960’s. Only a small number of the original Valentine diners exist today and only a handful are still operating. You can’t really visit (unless you want to see the police) but it is an interesting historical building! University of New Mexico (UNM) is the state’s largest university, with the campus occupying about 600 acres in Albuquerque with several branches elsewhere in the state. The university was founded in 1889 and the first building Hodgin Hall still stand on the campus. If you enjoy Pueblo Revival architecture, UNM has a number of buildings that were built or rebuilt in this style as well as a mix of other architectural styles (you can find a handy list here). I worked in the more distant north campus off Lomas at UNM Hospital, one of my favorite intern rotations. Much of the campus is walkable and there are several small museums on campus and a duck pond that is a long-time popular lunchtime spot for students and faculty. If you find yourself wondering what a “lobo” is after seeing a dozen “Go Lobos” signs, UNM’s sport teams are the New Mexican Lobos. Lobo is Spanish for wolf. Across the road you’ll find the interesting and quirky Frontier Restaurant, which has been serving New Mexican food since 1971, Saggio’s serving casual Italian with its crazy and colorful decor, and nearby on Central you’ll also find Max’s Magic Theatre which hosts regular magic shows. A great area to find student hangouts and good value eats. The 66 Diner started service in 1987, just after the decommissioning of Route 66. However the diner started in a converted 1940’s era Phillips 66 gas station. Sadly, the 66 Diner caught on fire in 1995 and was almost total destroyed but was restored and reopened in 1996. The Streamline-style retro diner serves hamburgers, green chile burgers, chicken fried steak, fries, house made pies, and milkshakes. It is also well-known for its Route 66 “pile up” (fried potatoes smothered with tons of toppings) and its blue plate specials which offers a different good value meal each day of the week. The diner has a retro 1950’s interior decor and on the outside there is a large sign collection on one end of the parking lot. A popular pitstop for visitors driving along Central Avenue. 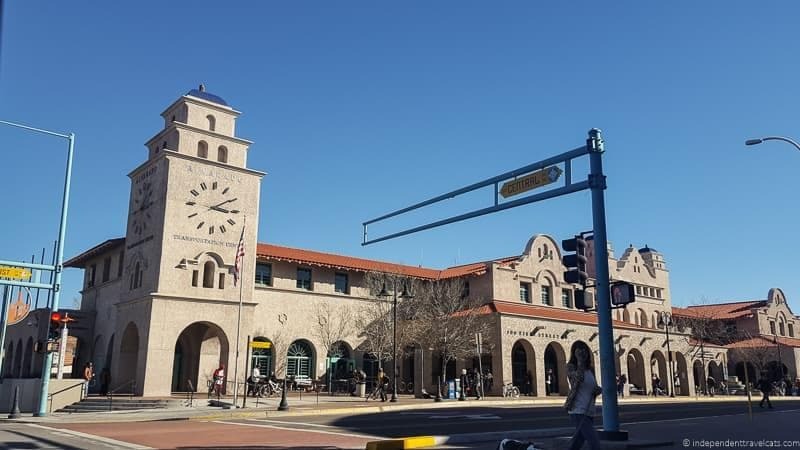 The Alvarado Transportation Center is a multimodal transit center serving as a hub for ABQRide, Amtrak, Greyhound Lines, and the New Mexico Rail Runner Express commuter rail line. It sits on the site of the former rail station and Alvarado Hotel. The Alvarado Hotel was probably the most iconic hotel ever built in Albuquerque and was considered one of the finest railroad hotels in the country in the early 1900’s. Built in 1902, the Alvarado Hotel was a railway hotel operated by the Fred Harvey Company. The hotel featured designs by famous architect Mary Colter, luxurious rooms, the most modern amenities of the time, a depot building, a telegraph office, and a large shop/museum of Native American goods. It was one of many such 20th century railway hotels that catered to railroad travelers. It would be the coming of the automobile and highways like Route 66 that would eventually lead to the decline of passenger train traffic and the death of these types of hotels. But in its heyday, the hotel hosted presidents and movie stars, and hosted social functions and galas like the annual Montezuma Ball. It was eventually demolished by the Santa Fe Railway in 1970 despite strong local resistance. 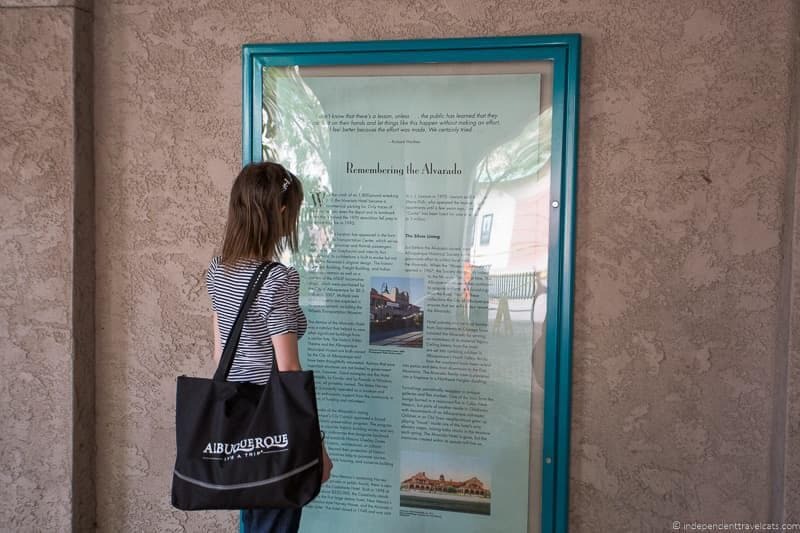 The Alvarado Transportation Center is actually designed in a Mission-Revival style reminiscent of the Alvarado (although with none of the glitz) and there are information panels along it that you can read about the history of the Alvarado Hotel that we found interesting. You can also walk to a brick wall mural about the Hotel Alvarado described next. The “Mother Road Mural” (a.k.a. El Camino De Los Caminos) is a large brightly colored mural just off Central across a parking lot on the side of brick office building. 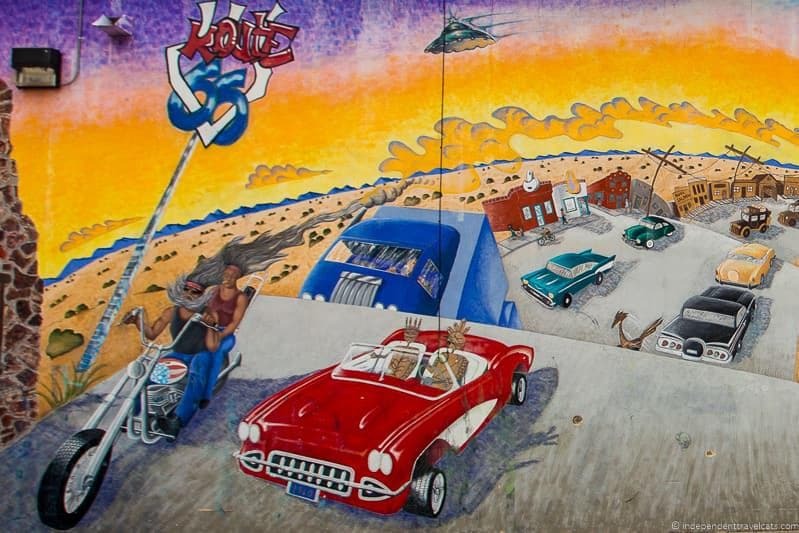 It was painted to capture the spirit of Route 66 and to denote the strong impact Route 66 had on Albuquerque. It was painted in 1995 by Hannah Bluhm, Eric Garcia, Michael Martinez, Natalia & Erika Meneses, Mario Ramirez and Ray Torres. 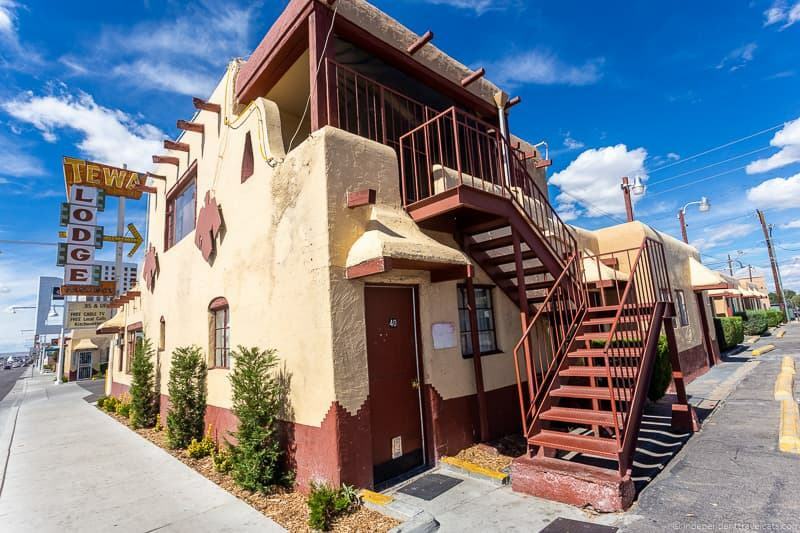 It located in downtown Albuquerque on the back of a brick office building on 2nd Street, and is partially viewable from Central Avenue. 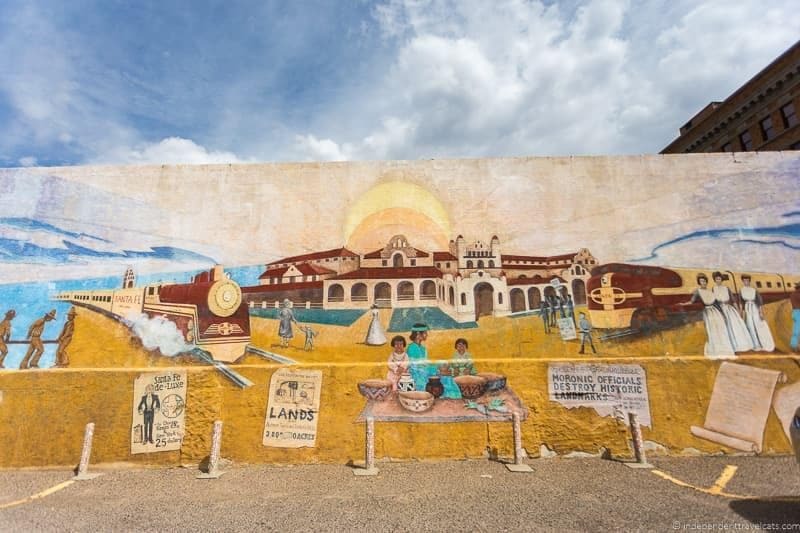 If you walk around to the other side of this building, you’ll find a mural depicting the Santa Fe railroad, Alvarado Hotel, and the Harvey girls. The mural makes it clear that the artists believe that it was a decision by “morons” to destroy the historic hotel. These murals, as well as a dozen or so others, are within a short walking distance of the Alvarado Transportation Center. Albuquerque is actually one of the top U.S. cities for public art with over 800 works, and many of these pieces are concentrated in the Downtown area. You can find out more information on the Albuquerque’s public art on the city’s website. The Standard Diner opened in 2006 but it occupies a circa 1938 building that originally housed a Carothers and Mauldin Automobile Service which was a Texaco station and a General Tire dealer in the early Route 66 era. The Standard Diner serves American classics with a modern twist (e.g., meatloaf, burgers, macaroni and cheese) as well as some New Mexican favorites. We definitely recommend it if you are looking for a more classy diner! The intersection of 4th Street and Central Avenue is one of those must-stop places for Route 66 lovers as it is now the only place where you can stand on two Route 66 alignments at once. The intersection of Fourth Street and Central Avenue is the place where Route 66 crosses over Route 66, meaning that the pre-1937 alignment of the road and the post-1937 alignment intersect. There used to be a popular cafe called Nick’s Crossroads Cafe here, but sadly it closed in 2013 and there is not much to see here other than the Route 66 signs. It is a bit like “standing on the corner of Winslow Arizona” or straddling state lines. Just be careful as this is a busy intersection! 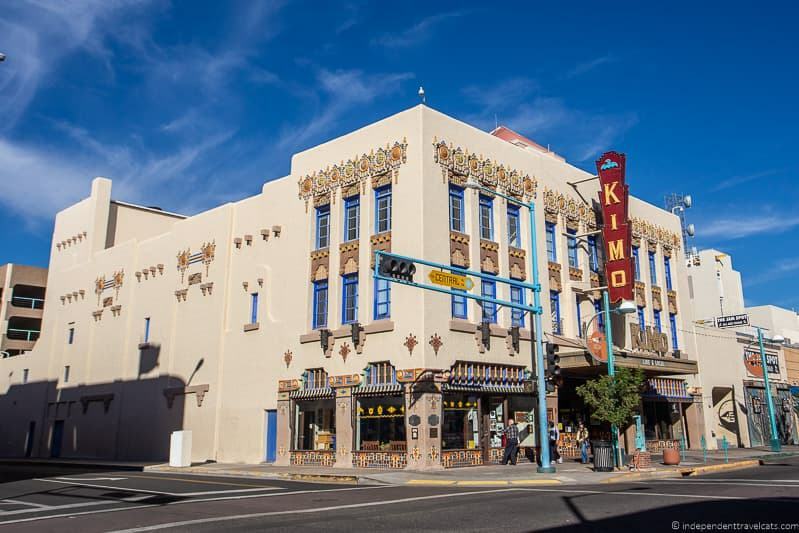 The KiMo Theater was built in 1927 in the Art Deco Pueblo Revival style of architecture, which is a blend of adobe building styles, decorative motifs from indigenous cultures, and the use of soaring lines and linear repetition. It is named for the Tewa word that means “mountain lion” and was designed by the Boller Brothers who designed about 100 Route 66 era theaters in the Midwest and West. This is probably the most iconic building along Albuquerque’s stretch of Route 66.If you have a chance to tour inside or see a performance, I’d definitely recommend it as the architecture and design are quite unique with painted murals and buffalo skull lighting fixtures. I was able to go backstage on one visit and was shown a shrine that the actors and staff maintain where they leave offerings and trinkets to appease the ghost of a 6-year-old boy who is believed to haunt the theater after being killed by the explosion from a hot water tank in the 1950s. Today, the KiMo Theater regularly hosts a variety of performances that include films, theater performances, contests, readings, local band nights, and ballets. A great place for a cultural night out in a wonderful historic venue. 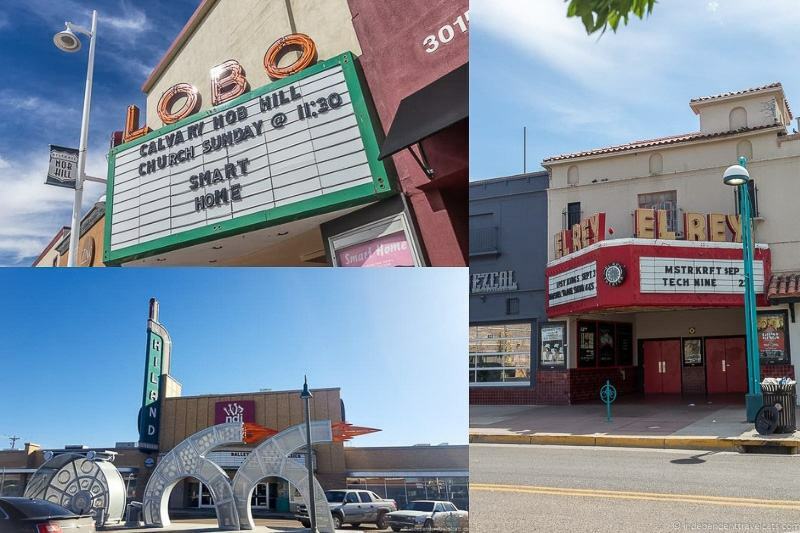 If you love historic theaters, Albuquerque has a few others from the Route 66 era lining Central Avenue that you may want to stop and see. All still have signs out front. These include the Lobo Theater, El Rey Theater, and Highlights Theater. Built in 1939, the Lobo Theater (3013 Central Ave NE) was the oldest standing movie theater in Albuquerque. It closed in 2001, later being leased by a church, and then it was to reopen again as a movie theater. We believe that it is still being used as a church. The El Rey Theater (622 Central Ave SW) was opened in the 1940’s and was a popular movie theater in the Route 66 era. It closed but has since recently been renovated and is open again as a performance venue, so another great place to check out a performance in the city. The Highland Theater (4800 Central Ave SE) opened in 1950 as a movie theater, was then a live performance venue, and is now occupied by NDI New Mexico (dance institute). Lindy’s was established in 1929 and may be the oldest continuously operating Route 66 restaurant in New Mexico. It is located in the 1906 Bliss building and has a diner atmosphere, serving an interesting mix of American, Mexican, and Greek diner food. It also has blue plate specials and they serve beer and wine. Open for breakfast, lunch, and dinner or just come in for a cup of coffee. It has a colorful and modest exterior, and is a special place to stop for Route 66 supporters. 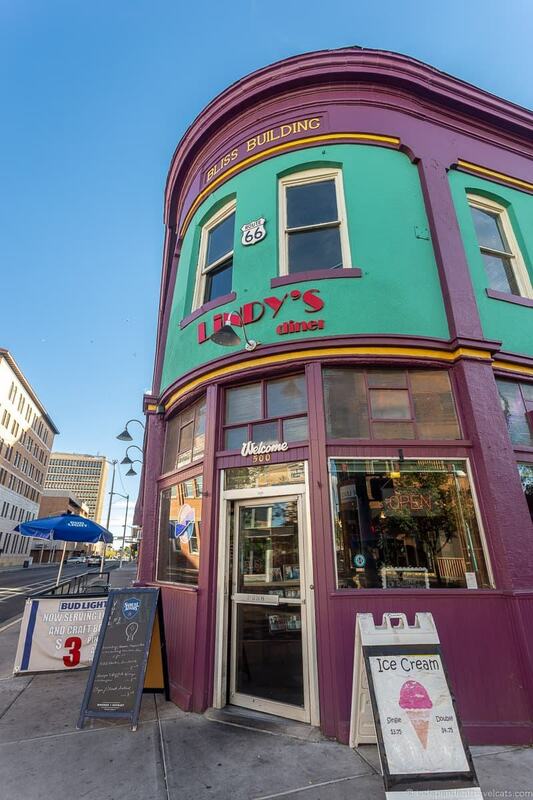 Lindy’s is located just past the KiMO Theater on the other side of Central Avenue. Skip Maisel’s Indian Jewelry & Crafts is one of the best Route 66 era stores on this stretch of the Mother Road. Built by Morris Maisel in the last 1930’s, it became a popular place and according to the store’s website in its heyday it employed over 300 craftsmen on premise and became the largest store of its kind in the world! 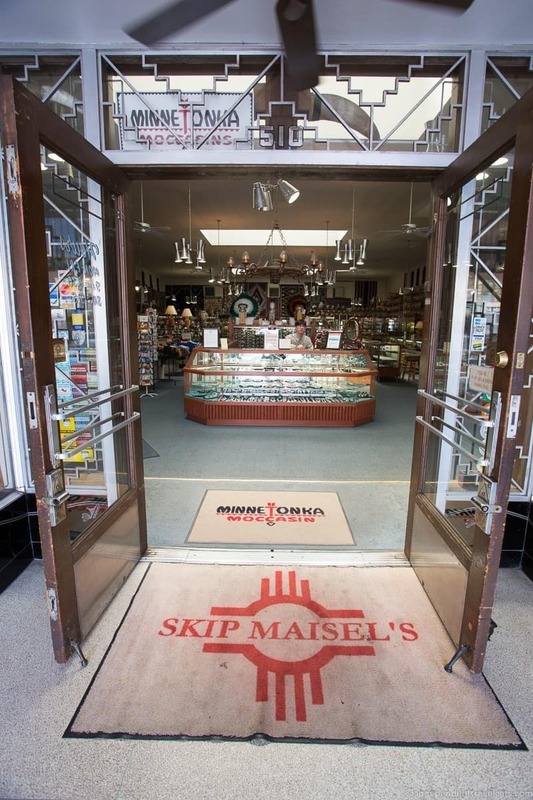 After being sold and later closed in the 1960’s, the store was re-opened in the 1980’s by Morris Maisel’s grandson Skip Maisel. Some great retro decoration inside and outside and has a nice neon sign out front. Today you can find an enormous selection of handmade Native American jewelry, crafts, kachinas, drums, pottery, and art. You can even see jewelers and craftsmen working in the store. Laurence bought me a turquoise ring from her last year for my birthday and the staff had it resized in the store while we waited. A great place to shop for local jewelry and authentic souvenirs, and many of the handmade items come with information about the artist who made it. The Dog House Drive-In is a Route 66 institution in Albuquerque. This is the second incarnation as the first store was located a few blocks east but it moved here in the 1960’s. The Dog House serves no-frills road food and take-out which includes burgers, hot dogs, fries, and shakes. The house speciality is the foot long chili dog, which is a foot-long beef and pork hot dog which is split and grilled and then served on toasted buns and garnished with red chili sauce. Onions, brown mustard, and cheese are the normal accompaniments. Today The Dog House serves an interesting mix of truck drivers, nearby workers, Route 66 tourists, and Breaking Bad fans. Normally they are quite busy, but waits are usually not that long. You can either eat in the small diner space inside or get the food for take-out, cash only. The animated neon sign of a weiner dog eating hot dogs and wagging its tail is fantastic! 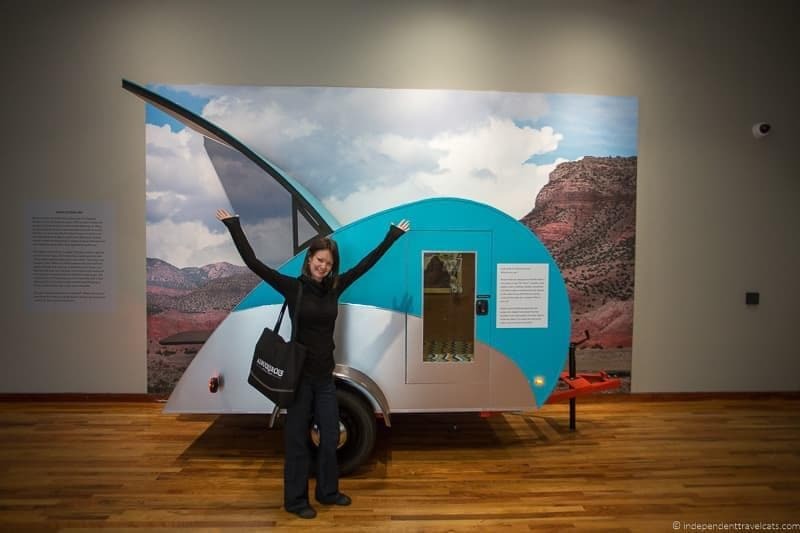 The Albuquerque Museum is not necessarily a Route 66 highlight, but it is probably the best place to learn about Route 66 in Albuquerque. It is also a great place to learn about the history and culture of the city. Located just off Route 66, the Albuquerque Museum has information about Route 66 and its effect on Albuquerque within its permanent exhibition. We were also lucky that our last visit to Albuquerque happened to coincide with a temporary exhibition focused on Route 66 so there was loads of Route 66 memorabilia and information. I’d also recommend a stop in the museum shop as they have some Route 66 related books and gift items. There is a small admission fee; however, the museum also has regular free admission days so check their website. I would also check to see if there are any Route 66 related events or exhibitions happening during your visit as they are not uncommon. During our last visit the National Museum of Nuclear Science and History also had an exhibition called “America’s Road: The Journey of Route 66”. 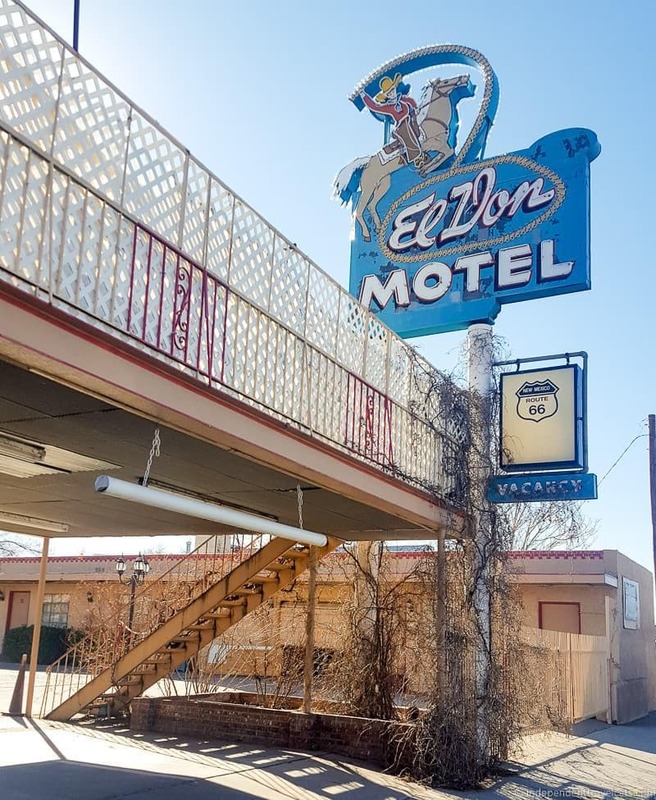 The El Don Motel opened circa 1946 and is a typical Route 66 era motel. It is best known for its neon and bulb sign featuring a cowboy riding a horse. When lit at night, the neon cowboy atop his bucking bronco whirls his lasso into the sky. Although the neon sign was restored in 2001, the motel has since closed. The sign was sadly not lit on our last trip to Albuquerque so not sure if it is still being turned on. The Monterey Non-Smokers Motel, or Monterey Motel, opened in 1946 and continues to offer good value budget lodging to travelers along historic Route 66. Great classic neon sign out front. 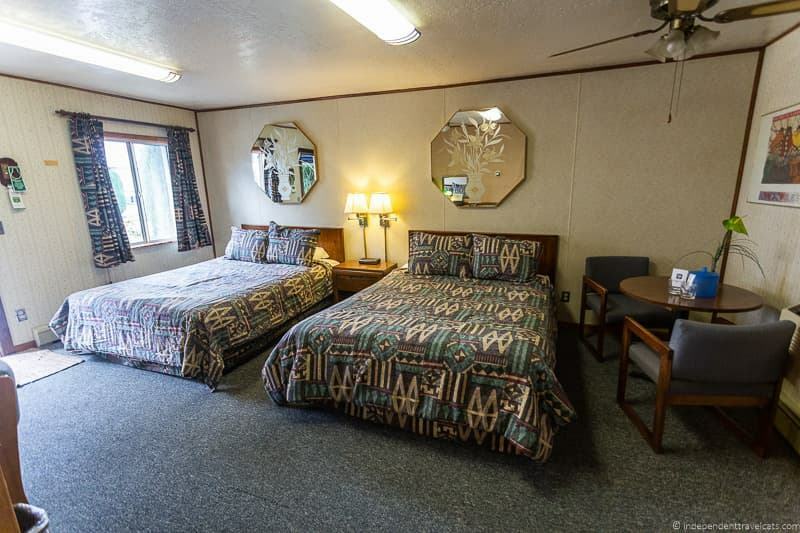 This motel continues to get good reviews from travelers and you can check rates here. It offers classic, simple clean rooms as well as free parking. It has a fantastic location within easy walking distance of Old Town attractions, museums, the Botanic Gardens, and the Aquarium. Non-smokers only! The El Vado Motel opened in 1937 and is probably the motel most associated with Route 66 in Albuquerque. It is also a historically significant property as it is one of only a handful or remaining auto court hotels from its era that has not be significantly altered. 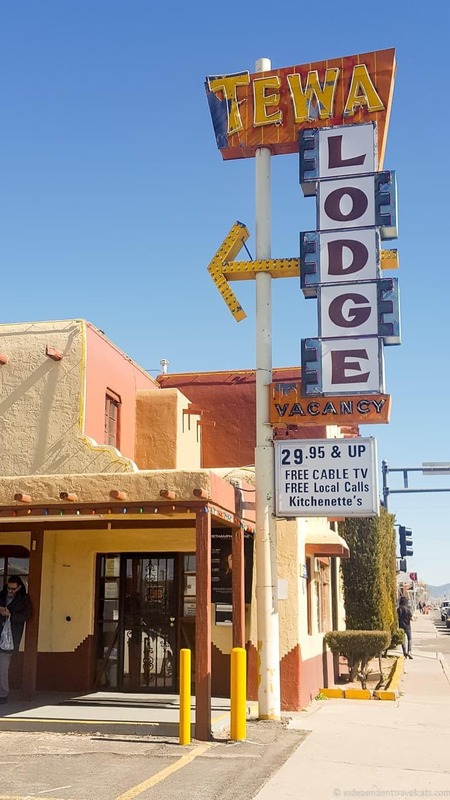 It was one of the first motels built in the city designed to welcome travelers who were using the new alignment of Route 66 that now went over the Rio Grande Bridge. The El Vado Motel originally had 32 units and a gas station and was built in the Spanish Pueblo Revival style. The motel kept operating long after Route 66 was decommissioned, but finally closed its doors in 2008. The property is listed on the National Register of Historic Places. 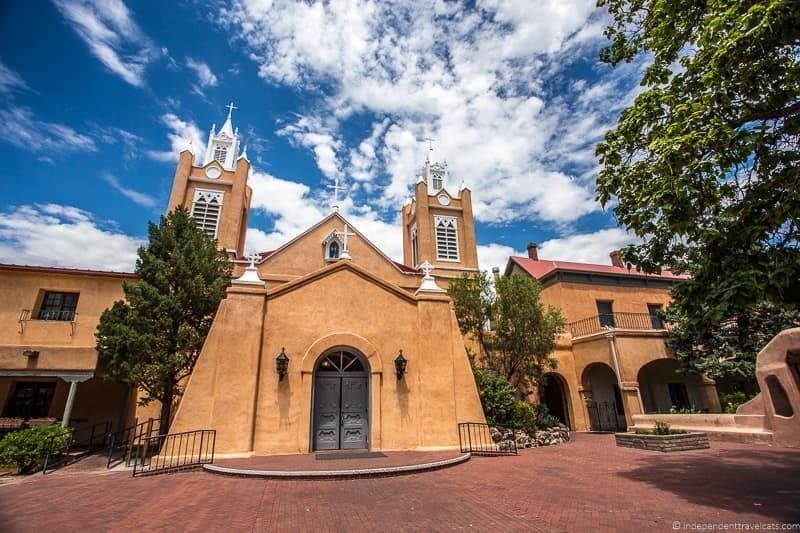 The city of Albuquerque purchased the property and the city, along with private developers, and it has been recently restored and reopened in August 2018! The complex has both private and public spaces meant to attract locals and tourists with a motel, public plaza, local shops, apartment complex, eateries, bar, and event space. The famous classic 1937 neon sign has also been restored after years of darkness. The motel features 22 rooms, both classic sized rooms (rooms the same size as they would have been in Route 66 days) as well as larger suites. The rooms are a blend of mid-modern and historic Route 66 era decor, and there is also an outdoor pool. You can check on the lodging rates here. Mac’s La Sierra Family Restaurant has been a family owned institution along Route 66 since 1952. The menu includes both American and New Mexico food, and they are known for their original “Steak in the Rough”. They have some great signage out front, including a giant steer. A freestanding bridge with neon including a Route 66 sign that crosses over the four lanes of West Central Avenue. 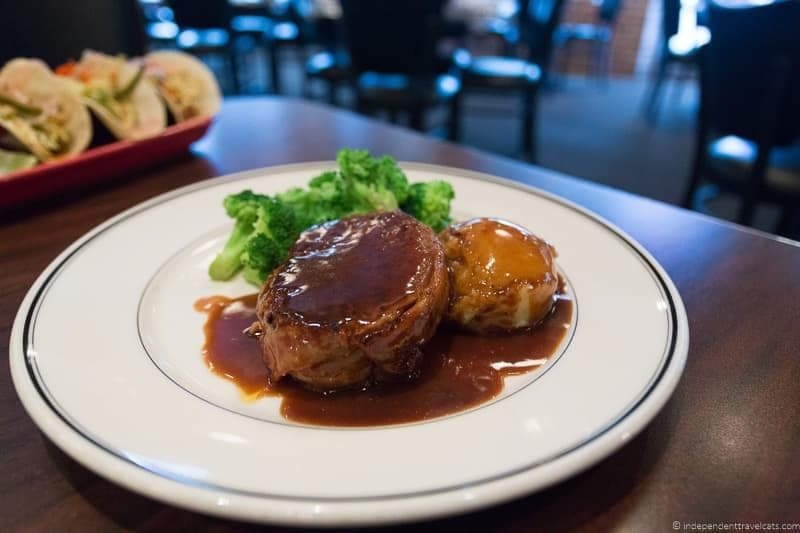 You’ll find it very close to the Western View Steak House. Western View Diner & Steakhouse has been a Route 66 landmark diner since 1941. It serves steaks, burgers, salads, friend chicken, breakfast, and Mexican food. Open for breakfast, lunch, coffee, and dinner. A much loved “greasy spoon” spot for a lot of locals. Nice neon sign out front. The Westward Ho! Motel is a motor court motel built circa 1948 with a southwestern theme. Out front is a nice neon sign featuring a saguaro cactus. This sign was restored in 2002. The motel has been used as a setting for some TV shows, including Breaking Bad spinoff Better Call Saul. The Enchanted Trail RV Park & Trading Post is located, at least partly, in the former Hilltop Trading Post built in 1947. The current RV park has over 100 RV spaces, a clubhouse, swimming pool, and laundry facilities. A unique feature is that it also has several vintage trailers you can rent if you don’t have your own RV or campervan – these 1950’s and 1960’s vintage trailers can accommodation 1 to 4 persons. 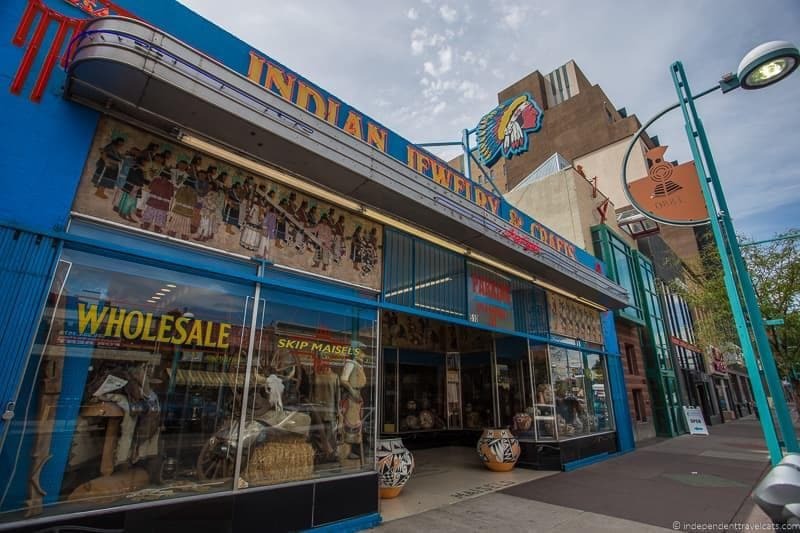 It also still has a trading post gif shop store where you can purchase Native American arts and crafts as well as a number of Route 66 souvenirs. This relatively new Route 66 themed gas station is a great place to fill up and if your hungry, it is one of a few locations where you can try a Laguna Burger (a green chili cheeseburger). This green chile cheeseburger became famous after becoming a popular item at the Dancing Eagle Supermarket in Laguna and is now sold in two other locations. As far as I know, there is no real Route 66 history here although the Route 66 theme is used throughout the gas station and small dining area. 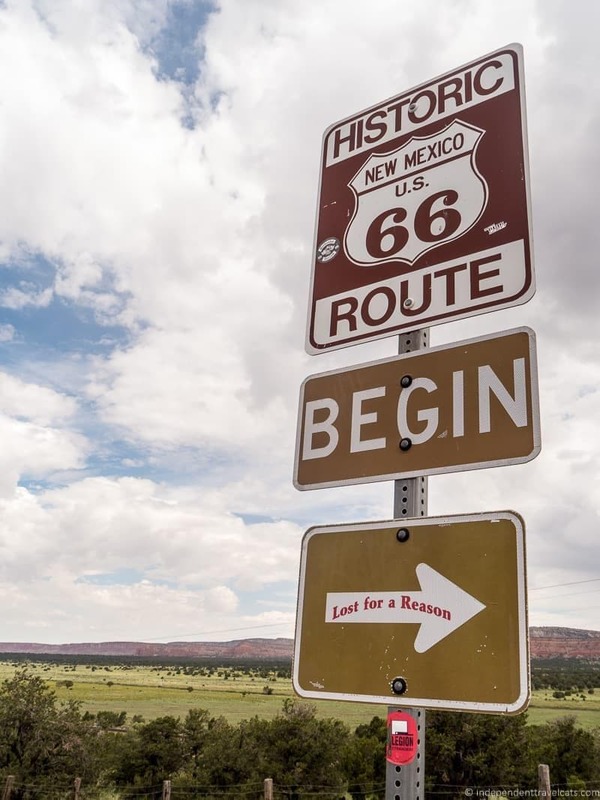 However, information panels do talk about the connection between the Native Americans who would sell and barter goods to early tourists traveling along Route 66, some later setting up trading posts and shops. If you are interested in the intersection of Native American and Route 66 history (the route ran through the lands of 25 different tribes! ), I recommend checking out the website American Indians and Route 66. 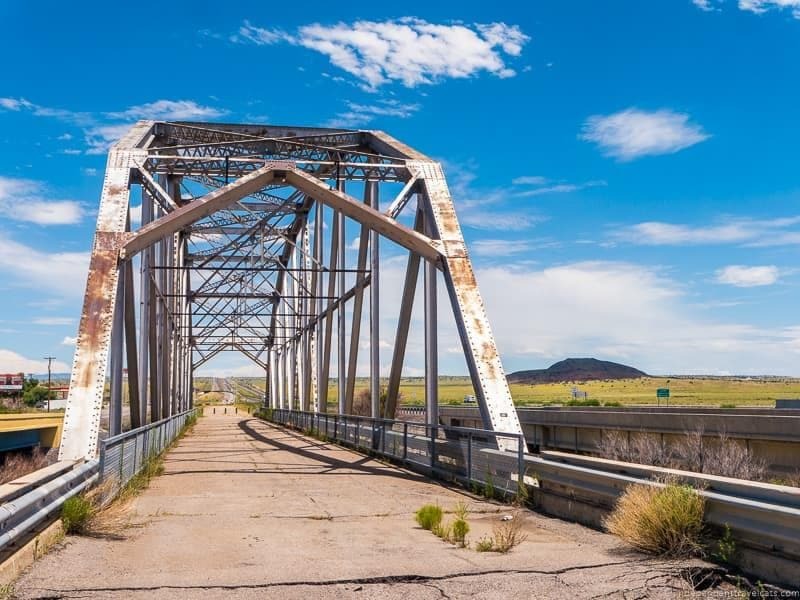 The Rio Puerco Bridge is a Parker through truss bridge built in 1933 for traffic to cross the Rio Perco (often dry these days). It supported the post-1937 Route 66 traffic and was operational until 1999 when it was bypassed. The Rio Puerco Bridge is located off of I-40 near exit 140 west of Albuquerque. It is closed to car traffic but can still be viewed and walked across. You’ll be able to see the Route 66 Casino from the bridge. The Route 66 Casino Hotel is a giant Route 66 themed casino complex opened in 2003 and has had a couple of major expansions since. It includes a casino with over 1,000 slots machines, table games, and a bingo hall, a full-service hotel, several restaurants, an entertainment theater, a kids game area, and a RV resort. The casino is owned and operated by the Pueblo of Laguna (who also run the nearby Route 66 Pit Stop and Travel Center) and is well-known for its buffet and for hosting world-class entertainment in its Legends Theater (e.g., Matchbox 20, Kenny Rogers, Moody Blues), both of which attract locals and travelers alike. We stopped at the casino on our Route 66 road trip and found it to be a modern and clean casino, although it should be noted that smoking is allowed in most of the casino although there are non-smoking areas. We had fun gambling a few dollars and having lunch here at Johnny Rockets, but even if you hate casinos, it is worth a quick stop to see the signs, the giant arrows in the parking lot, the neon, and the Route 66 decorations. If you watched the film Hell or High Water (2016), Route 66 Casino served as the Comanche 66 Casino in Oklahoma. Its flashy (quite literally), kitschy, and designed to make you want to spend your money, just like many of the Route 66 attractions of yesterday! Nearby you also have the Route 66 Travel Center (14314 Central Ave SW) where you’ll find a 24-hour gas station, convenience store, Dairy Queen, pay phones, and an ATM. Another good spot to stop for services before heading into or out of central Albuquerque. To help you find all the mentioned attractions above, we’ve made driving maps to help you find them and follow along if you are navigating to them. We’ve created one map for pre-1937 Route 66 and one for post-1937 Route 66 in Albuquerque. This map shows the locations of all the pre-1937 Route 66 spots mentioned above along 4th Street in Albuquerque. This map shows the locations of all the post-1937 Route 66 spots mentioned above along Central Avenue in Albuquerque. 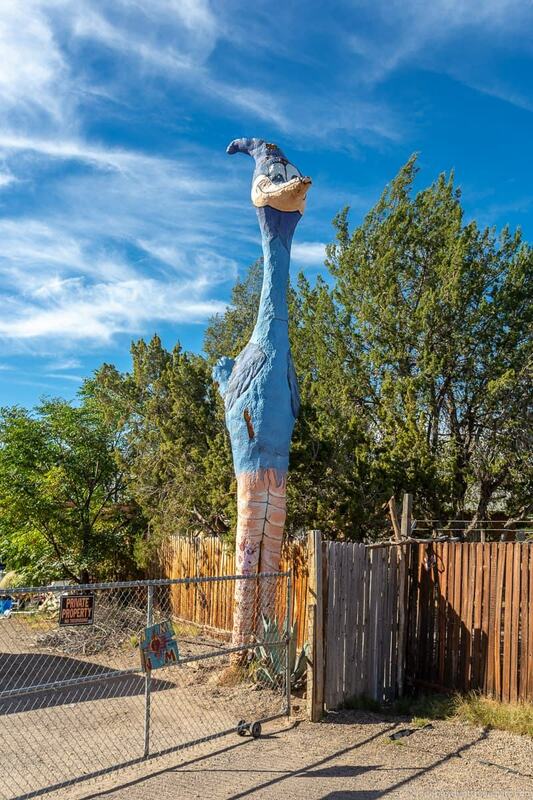 Albuquerque is a great place to find neon signs, and you can also find some other unusual attractions and features such as the giant roadrunner! “They say the neon light are bright on….Central Avenue”. Neon signs became popular after World War II and became associated with places like Times Square, theater marquees, and Route 66. There are a few dozen neon signs that you can find along Central Avenue (and 4th Street) and the best time to see them is to take a drive at night so you can see them lit up. If you have to choose between daytime and nighttime, I’d probably choose daytime as you can actually spend more time seeing places and exploring and also stopping to eat and shop along the way. Also it is difficult to take good photos of the neon signs unless you have a tripod and camera that does well in low light. But I’d definitely recommend driving the route in both the day and night if you have the time. 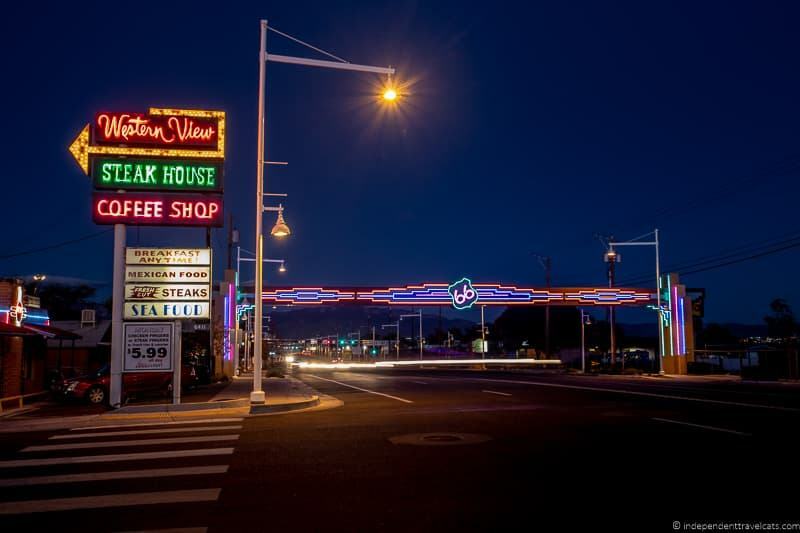 Albuquerque has been using funds to help restore some of the neon signs along Central Avenue which has helped make this one of the best stretches along Route 66 for neon lovers. Some notable neon signs (from east to west along Central) include Absolutely Neon storefront (3903 Central Avenue NE), Flying Star Cafe (3416 Central Avenue SE), 66 Diner (1405 Central Avenue NE), The Dog House Drive-In (1216 Central Ave SW), El Don Motel (2220 Central Avenue SW), Monterey Non Smokers Motel (2402 Central Avenue SW), El Vado Motel (2500 Central Avenue SW), and Westward Ho! Motel’s cactus sign (7500 Central Avenue SW). 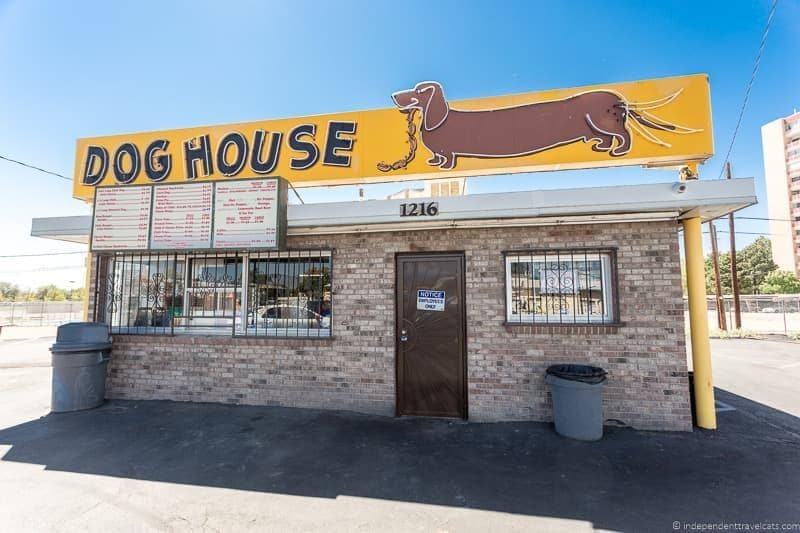 The Dog House sign is particularly cute as it features a weiner dog waging its tail as it eats hot dogs. However, probably the most famous neon sign in Albuquerque is that of the EL Vado Motel. A great place to stop if you enjoy neon signs is the Absolutely Neon store (3903 Central Avenue NE). Absolutely Neon is a store that makes, repairs, and sells neon signs. The owner Robert started out making signs for New York City’s Times Square and then moved to Albuquerque where they’ve been repairing and making neon signs on Central for a while now. The store front is decorated with neon signs, including some with a Route 66 theme, a great place to see at night if you love neon signs. In addition to the neon signs, there are a few others I would put in this category although Albuquerque doesn’t have any hugely popular Route 66 roadside attractions as many were removed in the 1980’s. 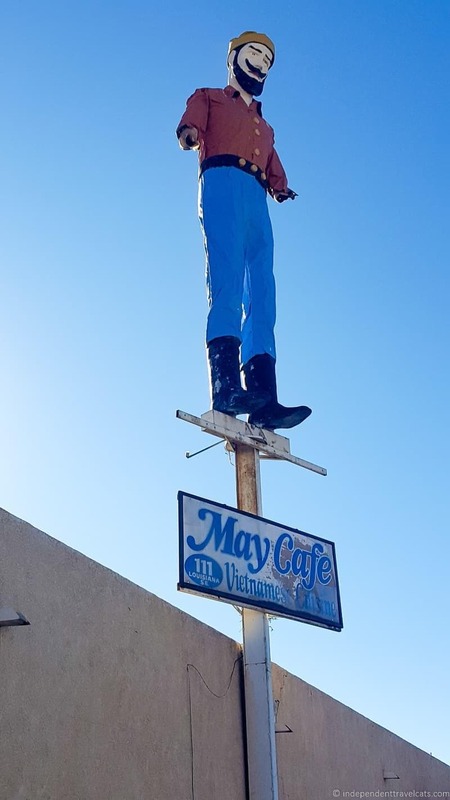 The first on the east side is the Lumberjack guy on the May Cafe sign (111 Louisiana Blvd SE) just off Central Avenue. May Cafe is a modest but popular Vietnamese food eatery (recommend if you are hungry for some good Asian food). Later on Central, keep your eyes open for the big cow (or is it a steer?) on the Mac’s La Sierra Coffee Shop sign (6217 Central Ave NW). If you are driving the Fourth Street section, there is the giant Madonna of the Trails statue as well as a giant spray foam roadrunner (near: 2219 Isleta Blvd SW). If you like public art from serious to funky to cute to political, you’ll find it all over the city, particularly in the Downtown area, included the mentioned Route 66 related mural. Also, although well off of historic Route 66, you’l find a giant Route 66 era red arrow in a Whole Foods parking lot (2103 Carlisle Blvd. NE) which was put here in 1961 for the opening of the Indian Plaza Shopping Center. The Route 66 Summerfest is an annual summer event (1 to 3 days in length) in Albuquerque celebrating the history and culture of Route 66 with live music, classic car shows, guided walking tours, art, kids events, and plenty of food and drink. It is a big street party that covers a mile-long stretch of old Route 66 along Central Avenue and is free to join. The Summerfest is a great way to celebrate Route 66 in Albuquerque if you happen to be in the area during the festival. If you have time in Albuquerque and are not just passing through, I’d recommend taking some time to hop out of your car and explore some of the many neighborhoods along Route 66. Here are just some brief descriptions of some of the major neighborhoods in Albuquerque along Route 66 in Albuquerque. Barelas and the South Valley – This area is a bit off the beaten path for tourists and has a strong tie to the city’s Hispanic roots. Lots of Mexican and New Mexican restaurants and grocery stores in the area. Good bet for those looking for the remnants of the pre-1937 Route 66, those wanting to explore the Barelas Historic District, and those interested in the National Hispanic Cultural Center. Downtown – Downtown is probably the area most associated with Route 66 in Albuquerque. Here you find numerous businesses, nightclubs, restaurants, and hotels. Best for those looking for public art, culture, restaurants, and nightlife. Old Town – This is the historic heart of the city since it was founded in 1706. Today, historic Old Town is the city’s cultural center, with seven museums and numerous shops, galleries, and restaurants. Best for those looking for historical buildings, shopping, art galleries, museums, and those who enjoy Santa Fe. 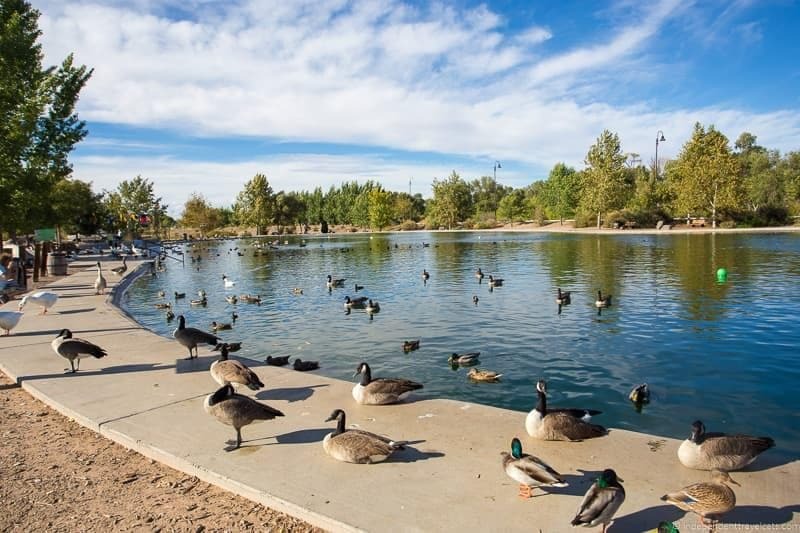 The nearby West Park area includes all the ABQ BioPark sites: zoo, aquarium, Tingley Beach, and the botanic garden. Midtown/University – This area of Albuquerque is dominated by the University of New Mexico campus and also has a number of hotels and restaurants. Conveniently located near the I-25/I-40 (Big I) interchange. Best for those wanting to explore student hangouts and the university museums. Nob Hill – In the early Route 66 era, this was the edge of town and once could see ranches and tumbleweeds from here. A lot of changed and this district has become one of the hippest and most refined areas of Albuquerque. Best for shopping, dining, and entertainment. If you’re looking for more inspiration, check out our guide to things to do in Albuquerque, which has lots of ideas for your visit. 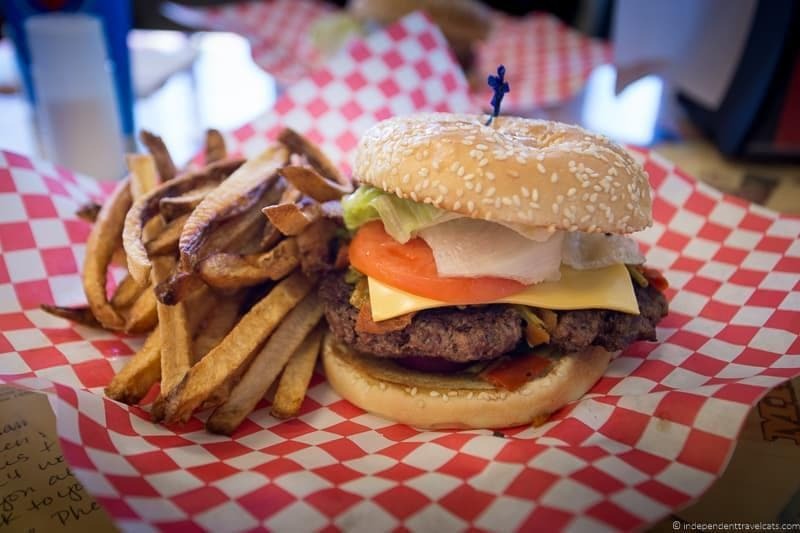 One of the things many people look forward to along Route 66 is the food! You’ll easy find all the road trip classics here like all-day breakfast, hamburgers, hot dogs, steaks, fries, hashbrowns, milkshakes, and homemade fruit pie. Some local favorites I’d consider trying are breakfast burritos, huevos rancheros (breakfast), chips and salsa, green chile cheeseburgers, green chile chicken stew, posole (Mexican soup), and enchiladas smothered in green and/or red chili. Basically if you see any menu item that comes smothered in red and/or green chili, it is a New Mexican dish, but feel free to ask for it on the side if you don’t like spicy dishes. 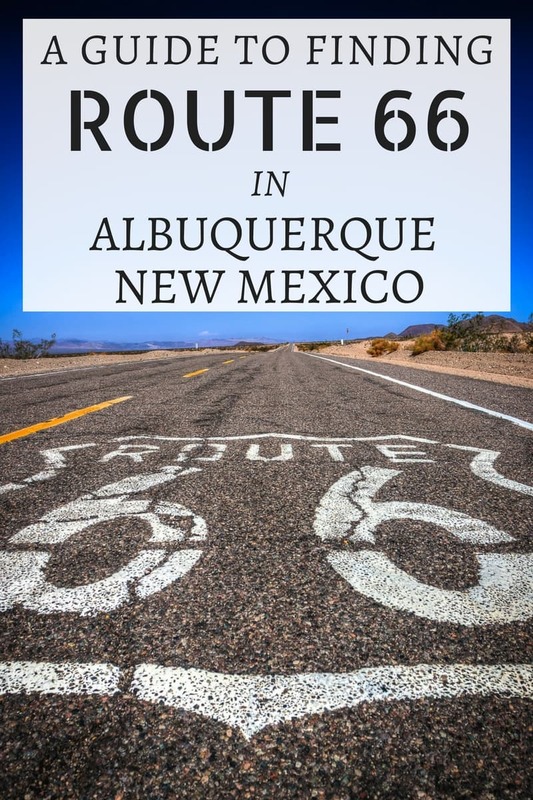 Albuquerque has so many diners, family restaurants, and drive-ins that you could spend a week trying to just eat at the ones just with a Route 66 connection! I’ve picked some of the top spots and I’ve divided them by those along Central Avenue and those along the pre-1937 alignment. Lists include very popular eateries and lesser known local favorites. 66 Diner (1405 Central Ave NE) This diner has become a Route 66 must-stop for many. The diner started in 1987 in a former 1940’s Phillips 66 gas station although this was largely destroyed by fire. 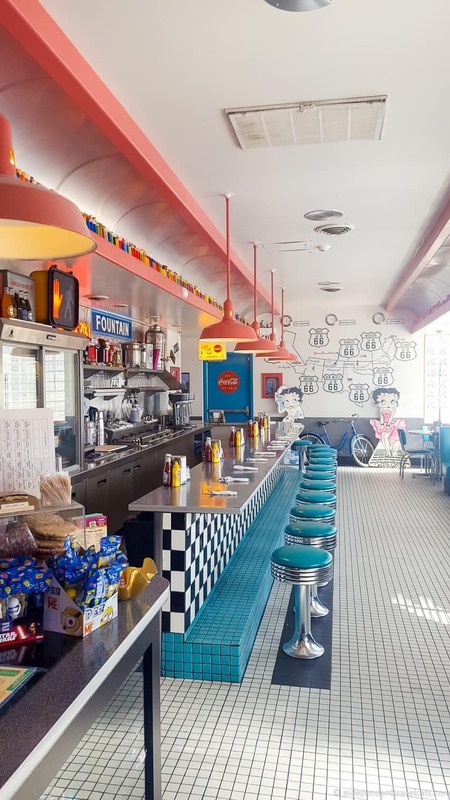 Today this retro-style diners serves up American and local diner favorites like burgers, chicken fried steak, fruit pies, and milkshakes and has a 1950’s interior decor. 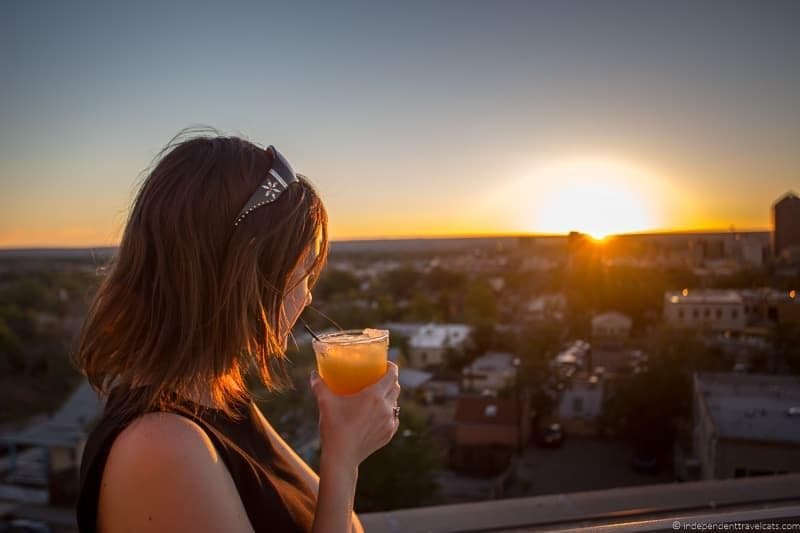 Apothecary Lounge (806 Central Ave SE) – This rooftop lounge is well-heeled spot for cocktails and pre-dinner nibbles, located on the top of the Parq Central Hotel. Indoor and outdoor seating with city views. Best known for its Prohibition era drinks and its green chili margarita. 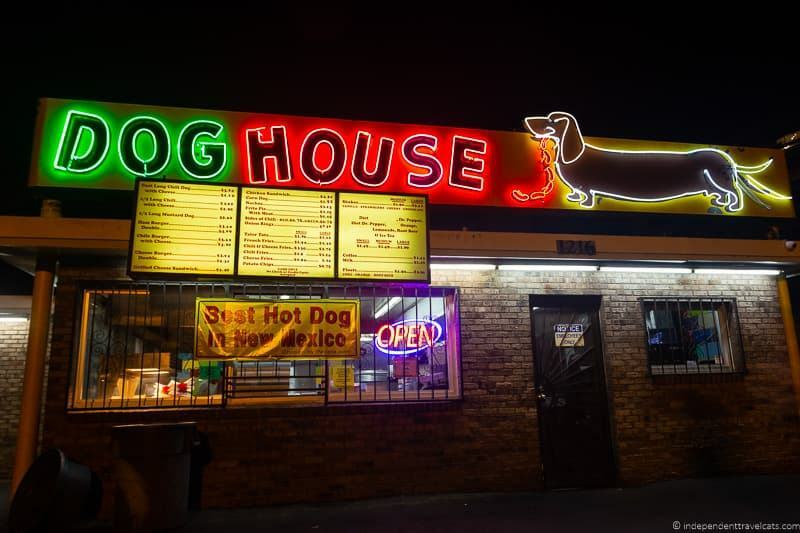 The Dog House Drive-In ** (1216 Central Ave SW) – This little drive-in spot was a long-time Route 66 favorite and continues to thrive. No frills American road food, known for its foo-long chili hot dogs. Cash only. Duran Central Pharmacy (1815 Central Avenue NW) This pharmacy has included a restaurant since 1975. A great place of authentic New Mexican food served in a local hangout reminiscent of the Route 66 era. Frontier Restaurant – This infamous UNM area institution has been serving American and New Mexican favorites since 1971. Its eclectic decor and menu draw a diverse crowd. A must-stop for John Wayne fans. Kelly’s Brew Pub (3222 Central Avenue SE) – This brew pub opened in 1993 but is housed in a 1939 Jones Motor Company building. Nice spot in Nob Hill and best known as a great spot for beer and a bowl of green chile chicken stew. Lindy’s ** (500 Central Avenue SW) – This unpretentious 1929 eatery may be the oldest continuously operating Route 66 eatery in New Mexico and is located in a 1906 building. Serves casual mix of American, Mexican, and Greek diner food. Loyola’s Family Restaurant ** (4500 Central Avenue SE) – This local family restaurant has been serving American and New Mexican classics since the 1950’s. 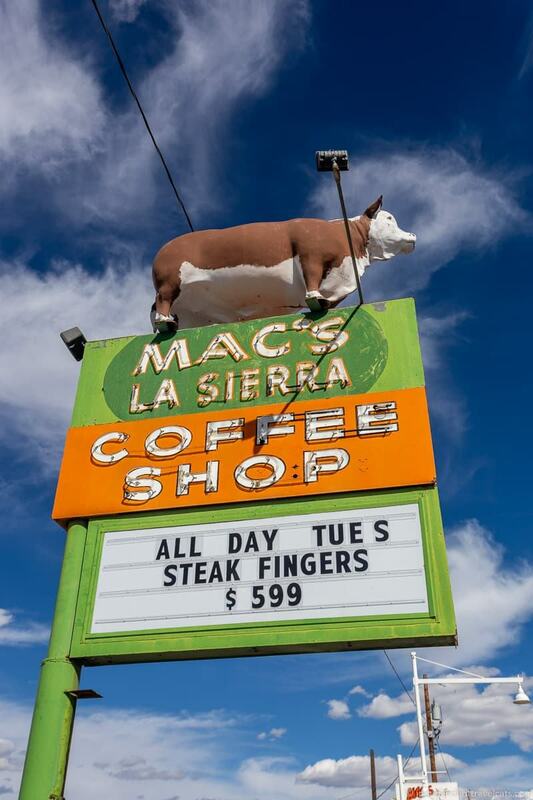 Mac’s La Sierra Family Restaurant ** (6217 Central Avenue NW) – Family owned casual restaurant since 1952. Serves American and New Mexican classics, and know for its original “steaks in the rough”. Scalo (3500 Central Ave SE) This Northern Italian restaurant is housed in the 1947 Nob Hill Business Center, and is a popular Nob Hill eatery. Great for those looking for a nicer (and pricier) dinner out and need a break from American and New Mexican food. They have a Bloody Mary bar on the weekends! Standard Diner (320 Central Avenue SE) – A great place for those looking for a more modern and upscale diner. Opened in 2006 in a converted 1938 Carothers & Mauldin service station, the menu features upscale twists on diner classics. Nice atmosphere and lots of favorite menu options here! These are listed in alphabetical order. Note one is located just outside of Albuquerque. 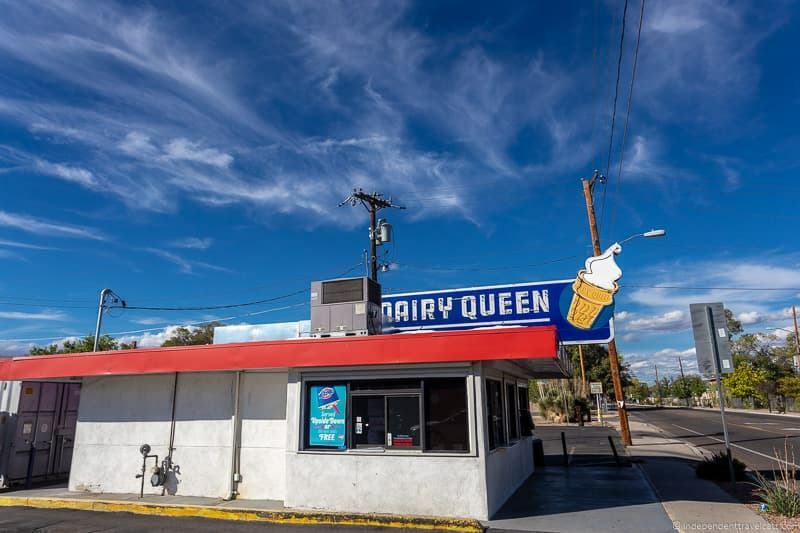 Dairy Queen Store (427 Isleta Blvd SW) – Classic 1950’s Dairy Queen serving American classics like burgers, hot dogs, ice cream, and milkshakes. Eat in, take out, or drive through. 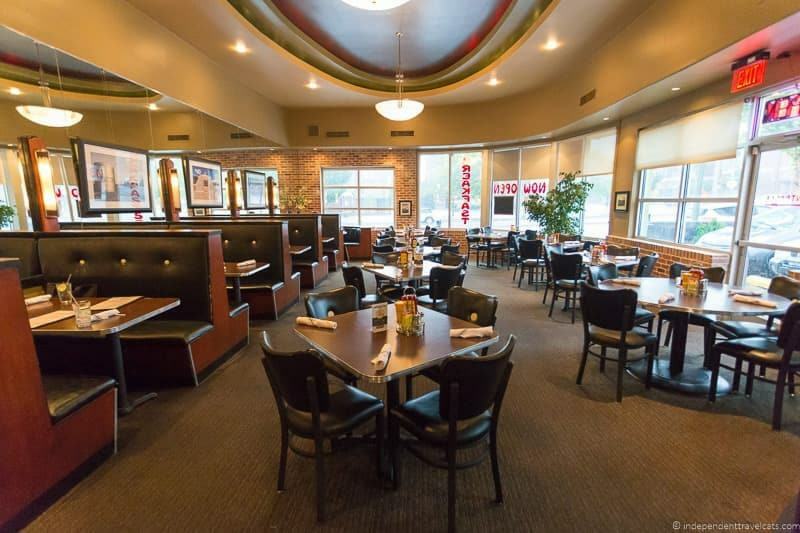 El Camino Dining Room (6800 4th Street NW, Los Ranchos De Albuquerque) – El Camino Dining Room is a bit north in Los Ranchos de Albuquerque but worth the drive if you like out-of-the-way local restaurants. It has a broad menu of American classics and New Mexican dishes and is best known for its huevos rancheros. Right across from the El Camino Motel. 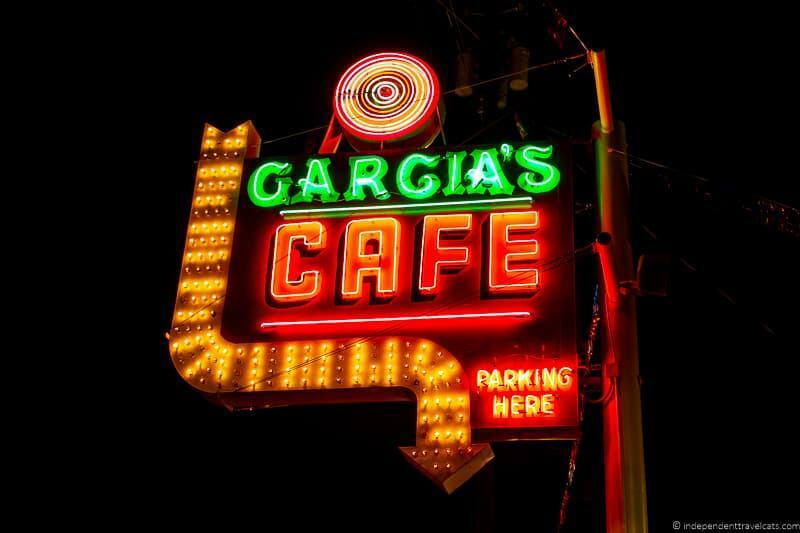 Garcia’s Kitchen (1113 4th Street NW) – A local Albuquerque chain of family-run restaurants that offers authentic New Mexican food. There are several locations in the city (including another on 4th Street at 4917 4th Street NW) but this is the original that opened in 1975. 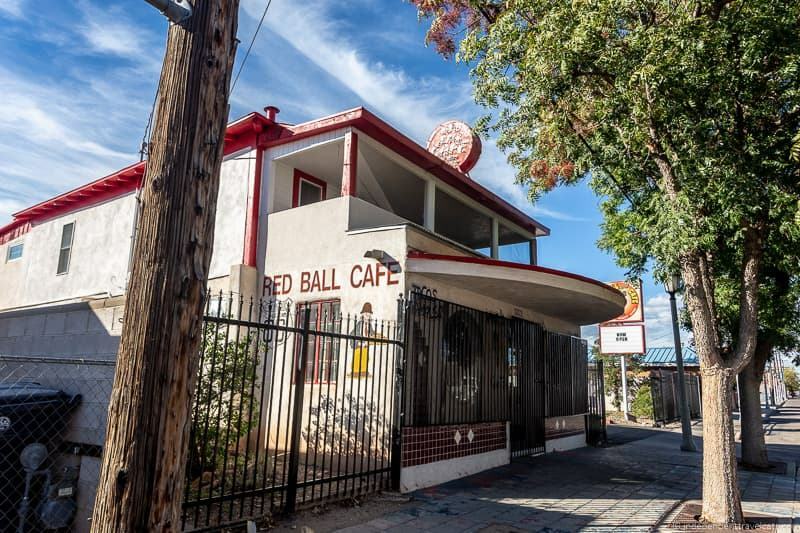 Red Ball Café (1301 4th St SW) – This long-time local eatery has been around since 1922 and although it closed for several years, it re-opened again in September 2018. They are best-known for their Wimpy burger (their speciality since 1922) although they also serve Mexican and New Mexican dishes. 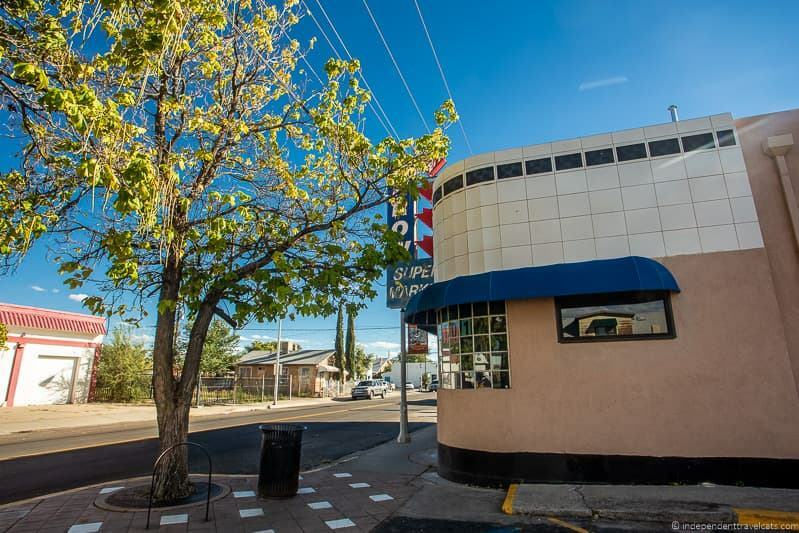 Sadie’s (6230 Fourth Street NW) – Sadie’s was begun by one women in the early 1950’s as a tiny restaurant (long gone now) and has become one of the most popular dining institutions in Albuquerque. The restaurants are known for simple New Mexican food, hearty portions, good salsa, margaritas, and being able to serve huge numbers at their three restaurants. Regularly wins awards such as best New Mexican restaurant in the city. Check out the wall murals for a peek into what Sadie’s looked like in the 1950’s. 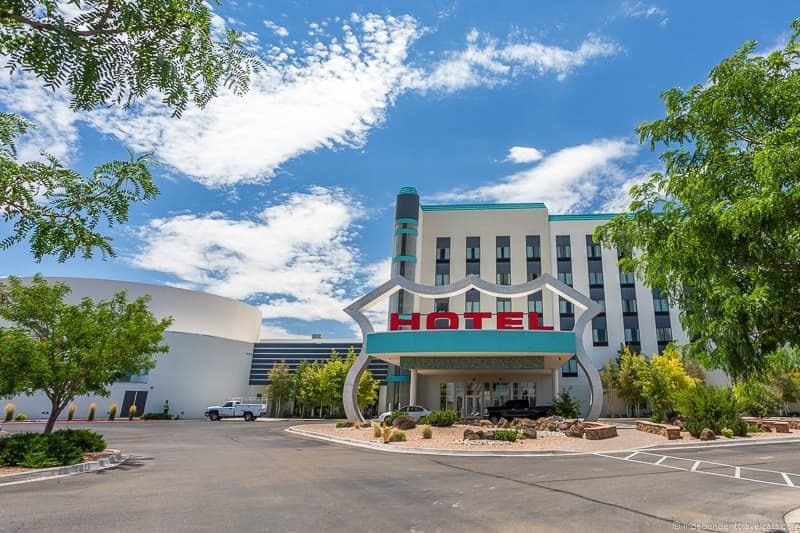 Many of these lodging recommendations include historical Route 66 properties described earlier but we’ve also thrown in some additional recommendation as well to provide variety for those not looking for a motel stay. We have been to many of these properties but have not stayed overnight in most of them so I would definitely check the recent reviews before making a booking. 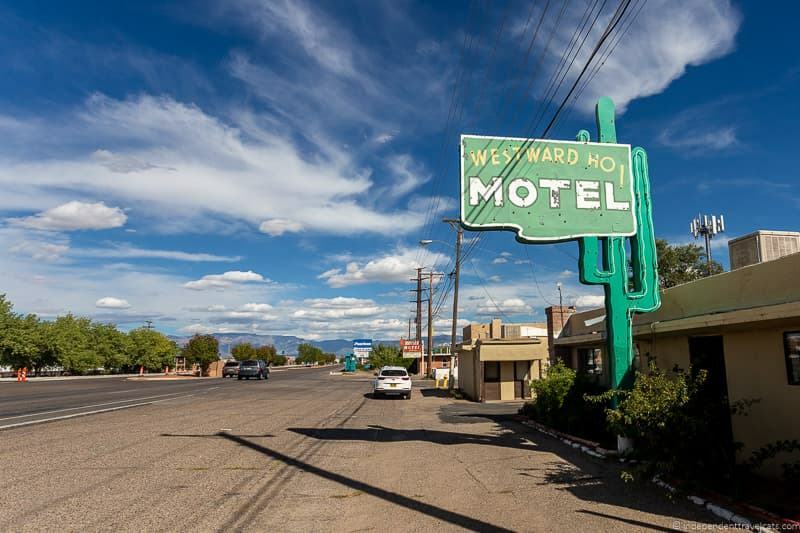 Sadly, many historical motels and hotels along Route 66 close each year so do call ahead or check online if there is one that you really want to stay at while in Albuquerque. I’ll try to keep this list up to date (do leave a note in the comments if you have an update!!) but changes are frequent. These are all classic motels and will give you the vintage motor court feel of yesterday. The only one that feels more like a regular hotel is The Hotel Blue which has been significantly remodeled and is a larger property. 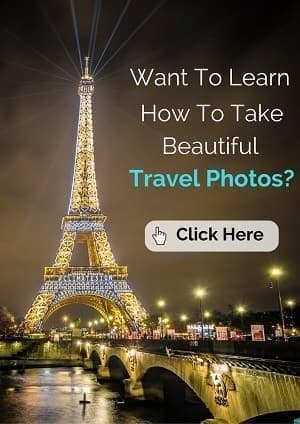 Many of these need to be booked directly with the hotel by phone or online, while a few you can also book online with booking sites like Booking.com and Hotels.com. Crossroads Motel (1001 Central Ave NE) – According to its BBB profile, this classic style motel started operating in 1965. It has recently attained attention for being used in Breaking Bad as well as other TV shows and films. Receives mixed reviews online and attracts more Breaking Bad fans than Route 66 fans these days. 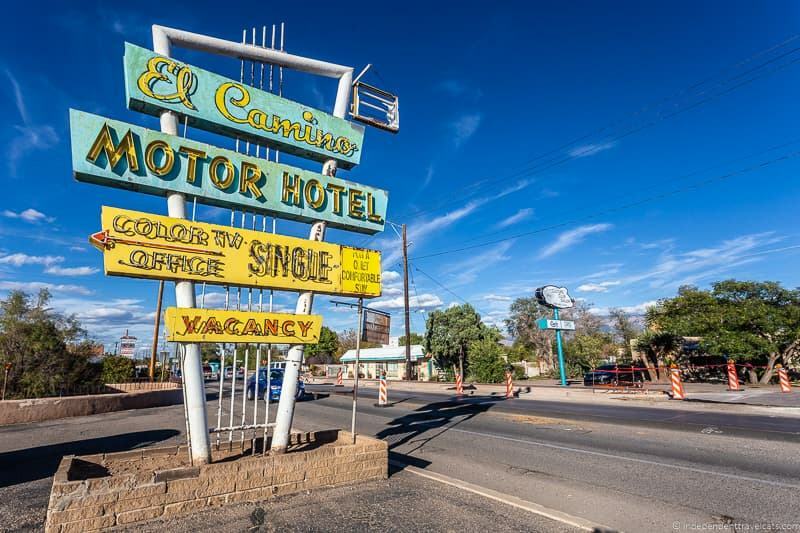 El Camino Motel (6851 4th Street NW, Los Ranchos de Albuquerque) – This Pueblo Revival motor court motel is the only survivor of the many motels that once lined the pre-1937 stretch of Route 66. Nice neon sign our front and generally positive reviews. This one is a bit outside the city and a good bet if you want to be away from downtown and want to drive the pre-1937 route. Across the street is the casual locally-run El Camino Dining Room dating back to 1950. 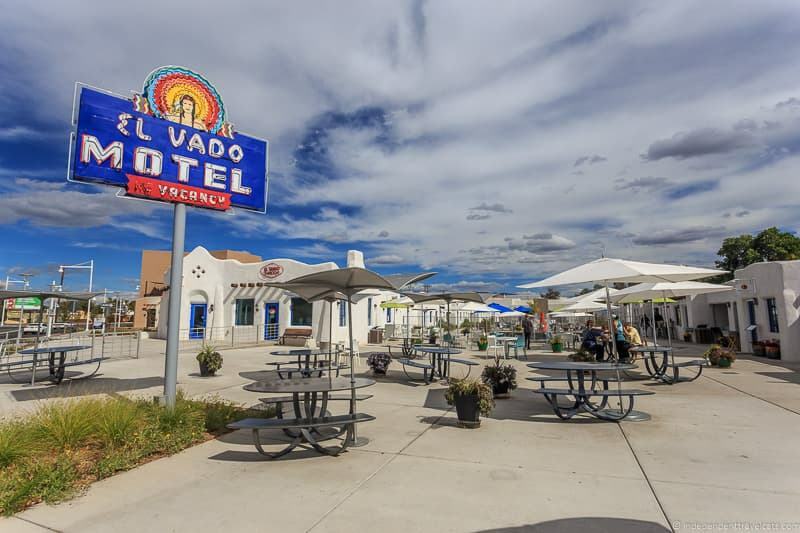 El Vado Motel (2500 Central Avenue SW) – This classic court motel was built in the Spanish Pueblo Revival style in 1937 and was one of the most popular Route 66 era motels. Has a classic neon sign out front. It was just recently restored and reopened in 2018! Hiway House Motel (3200 Central Ave SE) – This 1958 Hiway House Motel was once one of many of the Hiway chain motels. It now is one of the last survivors and has retained its neon sign and colonial-style architecture. Receives generally positive reviews online. The Hotel Blue (717 Central Ave NW) – This 3-star 140-room hotel started out as the Downtowner Motor Inn in 1965 and has had many owners, renovations, and makeovers over the years before reaching its current incarnation as The Hotel Blue. It is located near to the Convention Center, has TempurPedic mattresses, and gets generally positive reviews. 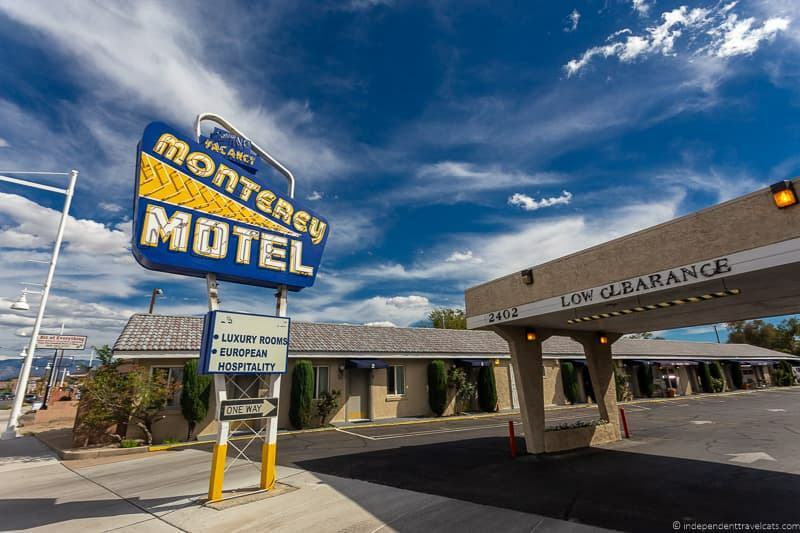 Monterey Non-Smokers Motel (2402 Central Avenue SW) – A classic 1940’s Route 66 motel centrally located in Albuquerque’s Old Town area. Great location for tourists and generally receives good reviews. See earlier description. Tewa Lodge (5715 Central Avenue NE) – A classic 1940’s Route 66 motor court motel. Recent reviews have been trending in a negative direction so check online before booking. See earlier description. To make reservations or ask questions, call 505-255-1632. 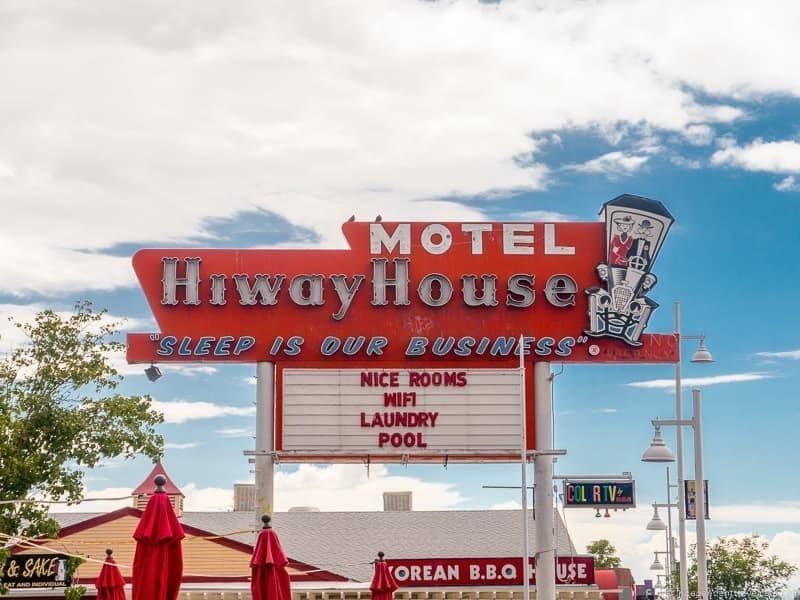 This list includes a wider variety of Route 66 era, historical properties, and/or Route 66 themed properties for those looking for something different than a classic motel or motor lodge stay. These include a bed-and-breakfast, more upscale hotels, and RV resorts. Bottger Mansion (110 San Felipe Street NW) – Located just off Route 66, this mansion actually predates Route 66, built around 1912 by a wealthy local merchant Charles Bottger. It later became a popular boarding house, and even Elvis Presley spent a night here! They have a Route 66 themed room that has old photographs from Route 66. 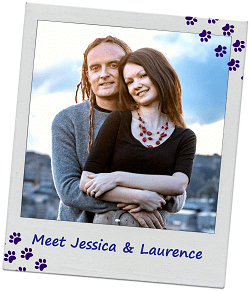 Great for couples looking for an intimate and romantic bed-and-breakfast. 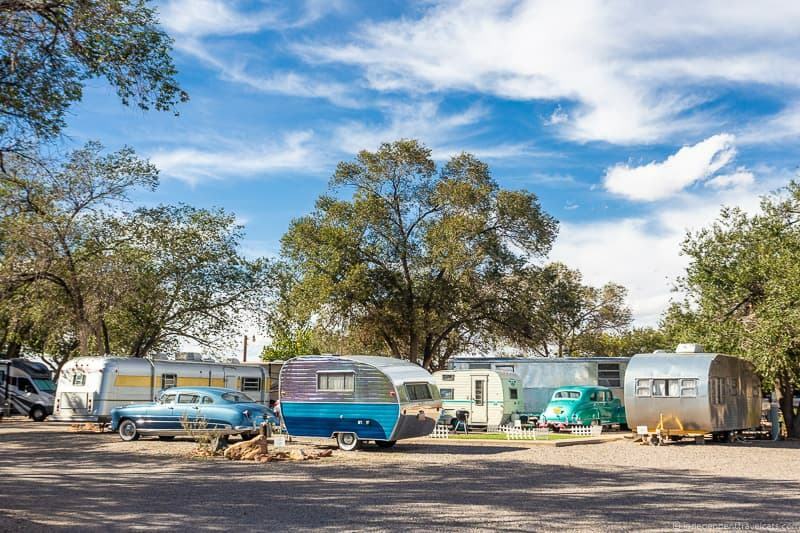 Enchanted Trails RV Park & Trading Post (14305 Central Avenue NW) – Perfect spot for Rvers or those wanting to stay in a 1950’s or 1960’s vintage travel trailer. See earlier description. Hotel Andaluz (125 2nd Street NW) – Hotel Andaluz is a hotel just slightly off Central Avenue that occupies the historic 1939 building that was originally built as the Hilton Hotel. The Hilton Hotel was the first property in New Mexico built by famous hotelier and New Mexico-born Conrad Hilton. It was then the tallest building in the state. Over the years it would change hands and names, but always operating as a hotel. It is the only survivor of the three grand Southwestern style hotels in the city, the others being the Alvarado Hotel (demolished in 1970) and the Franciscan (demolished in 1972). Today, Hotel Andaluz is a modern style 4-star luxury hotel decorated with a New Mexican and Mexican influence. Hotel Parq Central (806 Central Avenue SE) – This modern hotel opened in 2010 in a historic 1926 building that was originally a Santa Fe Railroad hospital for railway workers and later a psychiatric ward! The decor is a mix of modern and vintage and its Apothecary Lounge rooftop bar is a popular place for cocktails for locals and visitors alike. 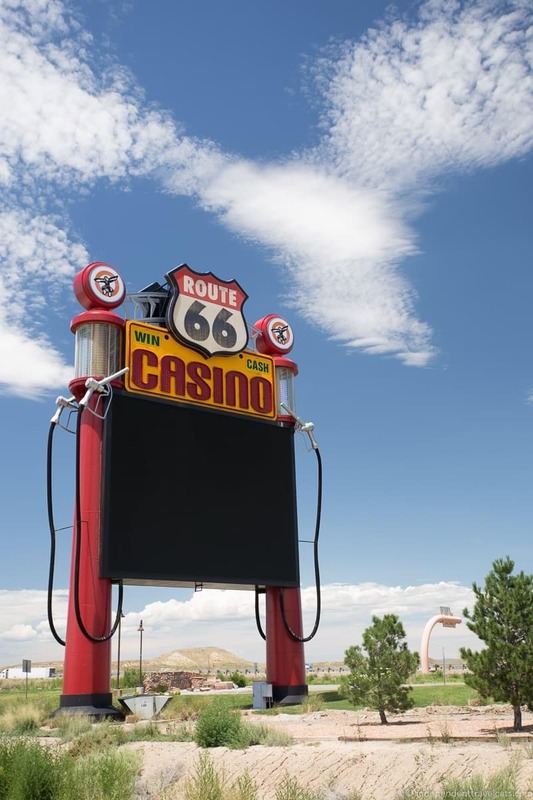 Route 66 Casino Hotel & Route 66 RV Resort (14500 Central Ave SW) – This Route 66 themed casino resort is great for RVers or those wanting to spend some time enjoying the casino. Includes modern hotel rooms and RV spots. See earlier description. So that ends our guide to Route 66 in Albuquerque. We hope that it has helped you find the attractions, diners, motels, and historical attractions along this stretch of Route 66. If you are planning to drive more of the Mother Road, check out our Route 66 guide and Route 66 itinerary. So that is our guide to finding historic Route 66 in Albuquerque New Mexico! Which of these places would be on our list of places to stop to eat, sleep, shop, or see on a trip to Albuquerque? Have you driven this section of Route 66 in Albuquerque? If so, feel free to leave us any tips or favorites you may have or any updates on openings or closures! As always, we love reading your comments and if you have any questions about either Route 66 or Albuquerque, just ask and we’ll answer them as well as we can! Thanks for your extensive work on providing your US-66 guide to Albuquerque where we spent a few days here for the opening weekend of the Balloon Festival. I was already aware and had breezed through your post, but I wish now I had paid better attention to the post, particularly because we only saw the north wall for the “Mother Road” mural and we didn’t go to the other side of the building to see the south wall 🙁 There are also a number of items you’ve listed which we’d love to do if and when we return to the A-B-Q. Thank you for all of this amazing advice! We’re getting ready to drive Route 66 with our kids and I’m hoping to stop by a lot of these places. I was wondering if you knew where you took the “Route 66” road painted sign picture. The one in your main image? I’d love to take a shot like that while we’re on our drive. Thank you! Hi Michaelyn, That sound like a fun Route 66 adventure with your family. Laurence and I are planning to drive a section of the route again in October, the Texas to New Mexico section with time in Albuquerque. 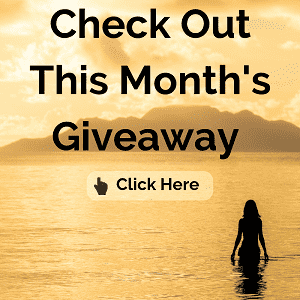 If you are driving the full route, I’d recommend checking out our Route 66 road trip planning post and our 14 day Route 66 itinerary as well. Yes, that was taken of the “Mother Road Mural” which is a mural that is on the side of a brick office building located on 2nd street in central Albuquerque, it is partially viewable from Central Avenue. It was originally painted in 1995 and was still there when we were last in Albuquerque 2 years ago. You can see the section in the article called “The Mother Road Mural” & Alvarado Hotel Mural” for more information on the mural and how to find it. Hope that helps and wishing you a wonderful Route 66 road trip! Appreciate the article and time you spent on it. We’ve been to the city twice, pretty-much forced out by road closures, construction, and crazy detours. Thanks kindly for the info. We’re heading thru again in 2019. Your article and descriptions will help…thanks. All the best. Excellent post about Route 66 in Albuquerque! Thanks for this great article, I will share it ! Pity not to have known about it earlier, I missed a lot of things! For sure I’ll use it ! but I fear I’ll need several days to do all this ! Do you have other posts about Route 66 stretches ? This is an amazing post! I added it to my recent BioPark post because it provides such a detailed list of amazing experiences elsewhere in ABQ. Check it out if you’re interested. Interested readers may also enjoy this the newly formed Downtown Arts & Cultural District, it includes a wide array of coffee shops, galleries, museums & cultural attractions, public art & murals, etc. Alas, to see the classic/iconic Dog House sign from the era of The Road: http://tinyurl.com/lcu4jqm. Thank you for the throwback, Jessica. I have fond memories of Frontier Restaurant. It was my hangout back when I lived in Albuquerque. Funnily enough, I never connected Central Avenue with Route 66 until I read your article. We haven’t been in Albuquerque in ages, but I remember some of those landmarks. I’m ready to take your guide and go find them again! Plus…love the food in New Mexico. 🙂 Thanks for all of the detail – very handy! This is a really great, comprehensive resource. I’ve always wanted to drive along this stretch of Route 66, but frankly, I wasn’t sure what exactly what there is to see. I think I’d want to eat at the 66 Diner and search for both the neon signs and the quirky signs. You’ve got us wanting to go back to Albuquerque Jessica! Corinne lived there in the 80s (I know, we are that old!) and she had a favorite little Mexican take out near the base that was still there several years ago. There’s nothing like New Mexican food! I’ve always wanted to drive Route 66! I’ve never had the chance! Very thorough! Pinned for later! One thing I love about your blog is the wide variety of places you go. This is just “true Americana” to me, a glimpse into a wonderful time in our country’s history. I’ve never been to New Mexico, but would love to go. Seems like the perfect vacation when you don’t have an agenda… just let yourself move along and soak it in. 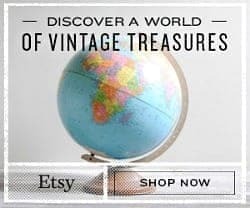 The signs are so fun – I often see them on American Pickers where they are in high demand. I would love the casual food because that is my favorite. Not sure about the accommodations, but then again, I guess a motel stay really is part of the journey.! Route 66 goes through my backyard (actually about 1/2 mile away from it), so I figured if I start driving on it I may end up in Albuquerque. It seems like a very unconventional city with a very relaxed atmosphere. A lot of information here, Jessica. This one is getting bookmarked too for my future travels. I only passed through Albuquerque briefly on my way to Santa Fe, so I really need to go back and explore it more. I would love to see some of the art and eat more of the local foods. So many great ideas in this post and lots of useful info!